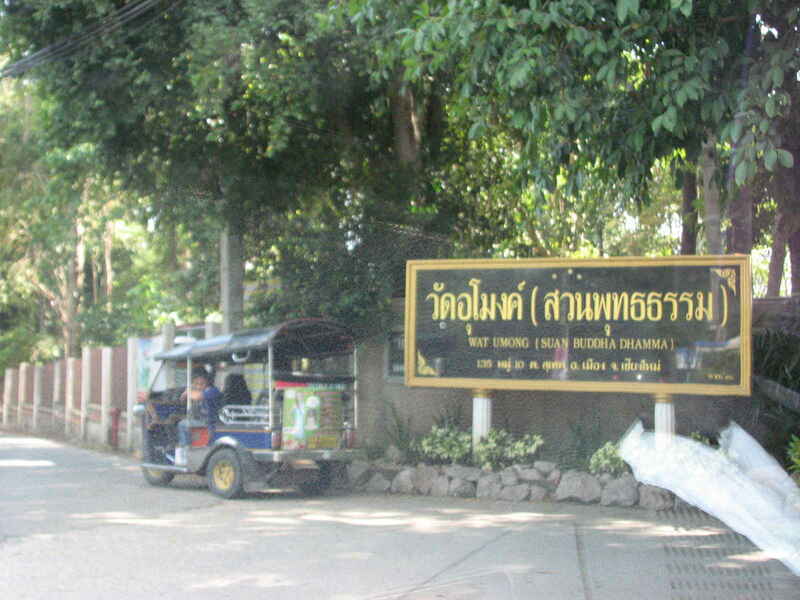 You are currently browsing the archives for the ทำหมันสุนัขและแมวจรจัด category. 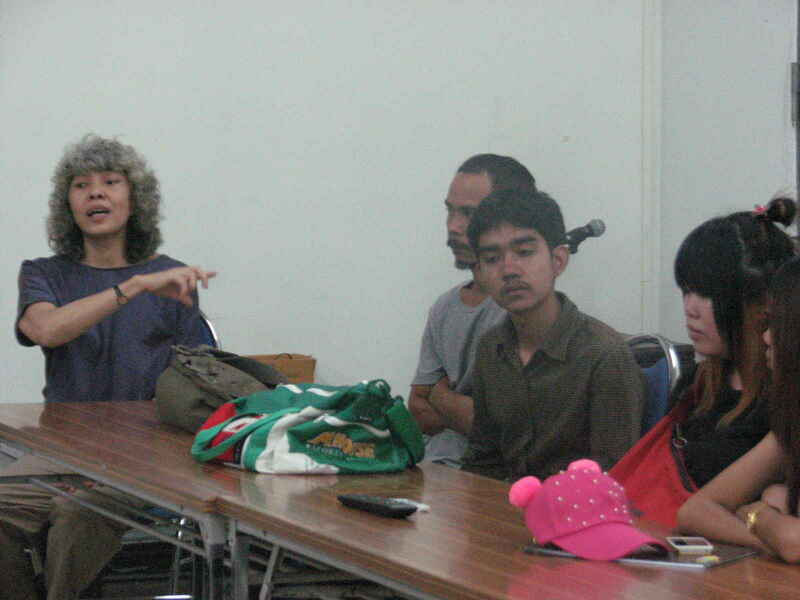 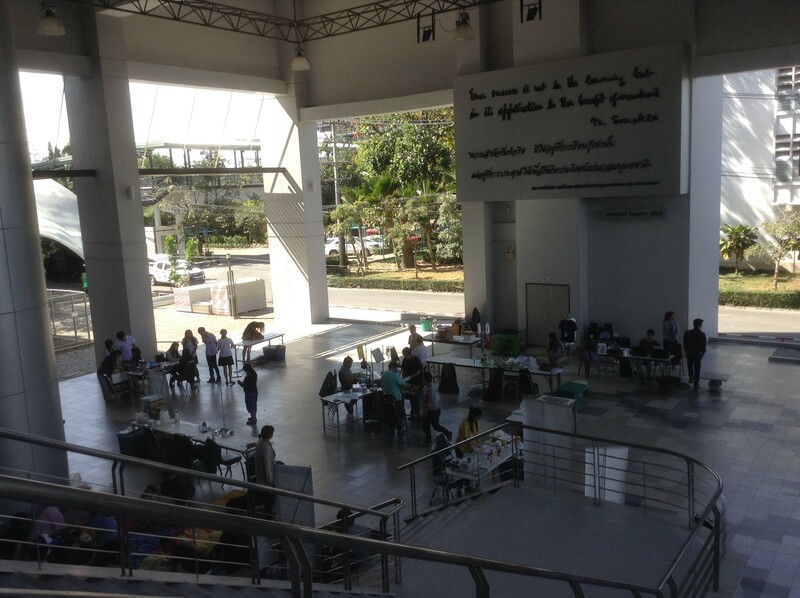 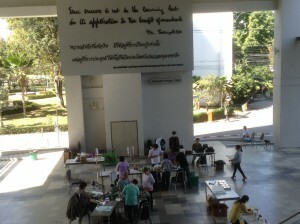 Multidisplinary Art CMU วิจิตรศิลป์ สหศาสตร์ศิลป์ มช. 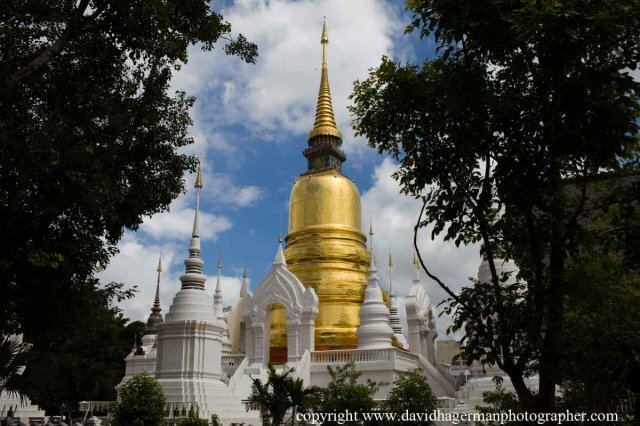 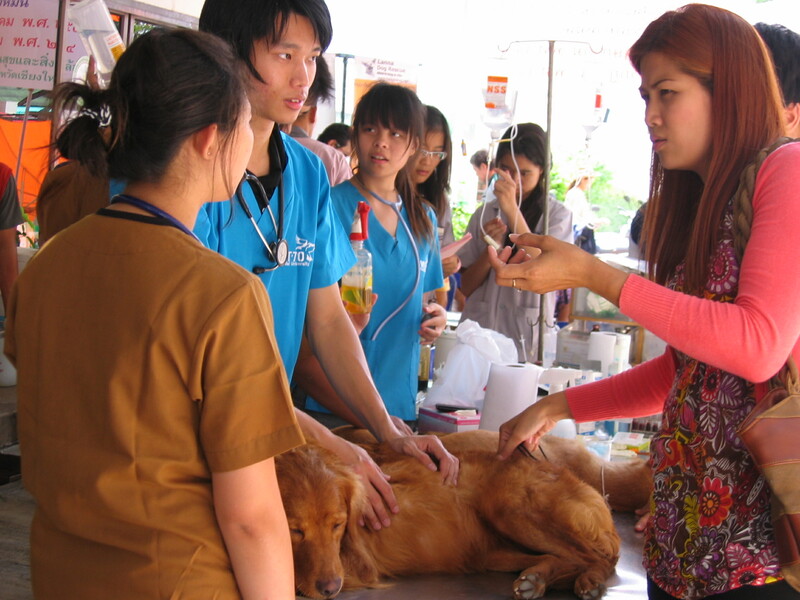 ศิลปะ สื่อ และสัตว์ที่บูรณาการกันอย่างแหลมคม โดยการนำของ รศ.อารยา ราษฎร์จำเริญสุข ร่วมกับนักศึกษาสาขาสหศาสตร์ศิลป์ ได้ทำโครงการแก้ปัญหาสุนัขจรจัดในมหาวิทยาลัยเชียงใหม่อย่างปัญญาชนและยั่งยืน มีการประชุมวางแผนอย่างเป็นระบบตั้งแต่การหาทุนเพื่อจัดซื้อเวชภัณฑ์ทำหมัน การวางแผนจับสุนัขจรจัดตามตึกต่างๆ เป็นตามหลักสากลแบบ RSPCA จัดระดับกลุ่มหมาตั้งแต่พวกขี้เล่นไปจนถึงพวกขี้ระแวง แผนจับเริ่มจากแบบละมุนละม่อมไปหาหนัก ตีสนิท ให้อาหาร ให้ยาซึม ไปจนถึงขั้นสุดท้ายเป่ายาสลบในวันทำหมัน ในวันนั้นได้หมามช.ไปทำหมันฉีควัคซีนป้องกันโรคพิษสุนัขบ้าทั้งหมด 28 ตัว เห็นวิจิตรศิลป์สไตล์อาร์ต ๆ อย่างนี้ ลุยจริง ทำจริง แต่อ่อนโยนอย่างน่าประทับใจ ผ่านเข้า มช เห็นหมาปลอกคอสีส้มสะท้อนแสง พิมพ์ทำหมันแล้ว นั่นละ ฝีมือกลุ่มนี้! 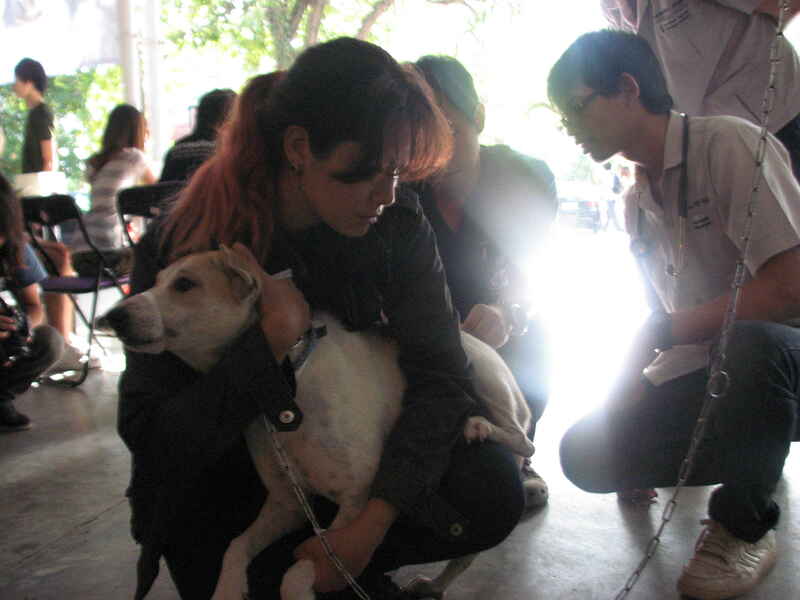 How do fine art students connect with dog sterilization? 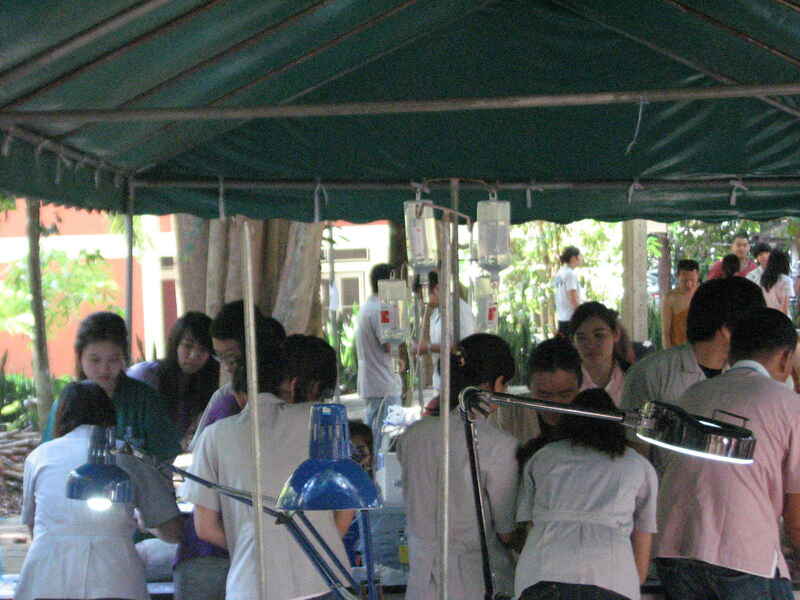 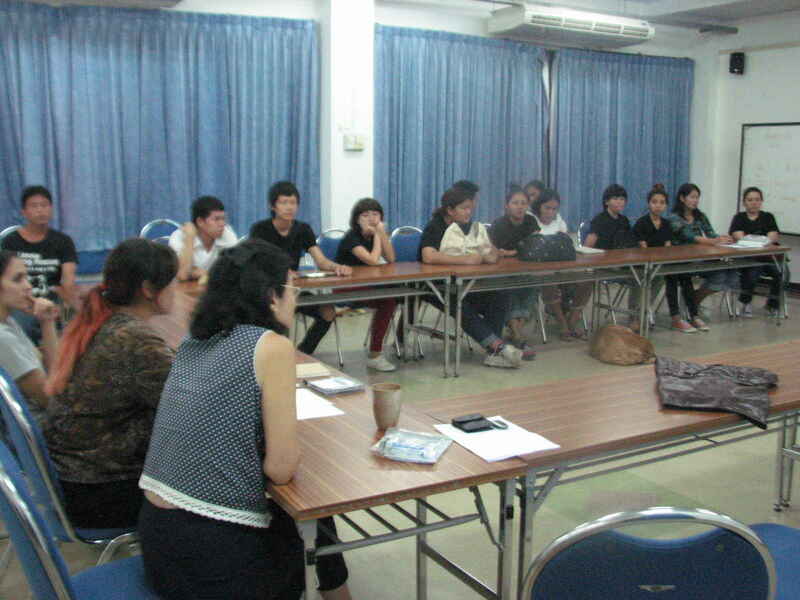 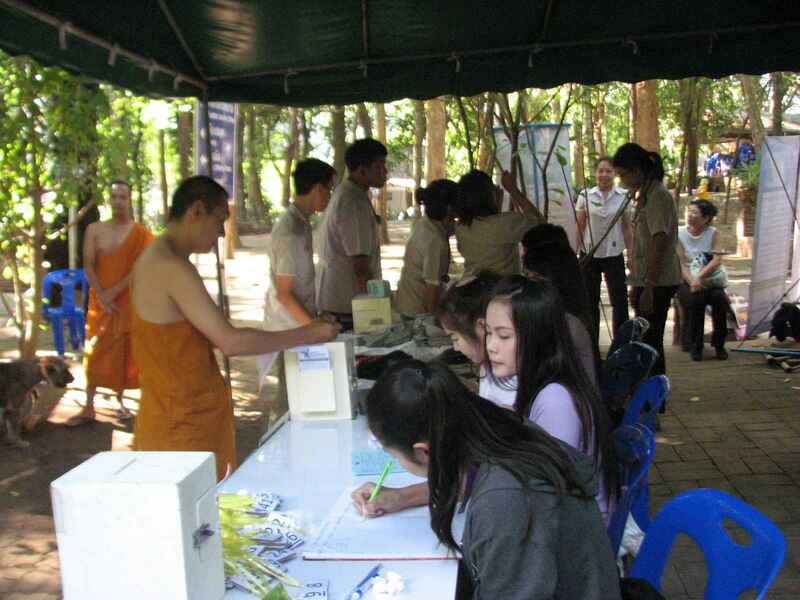 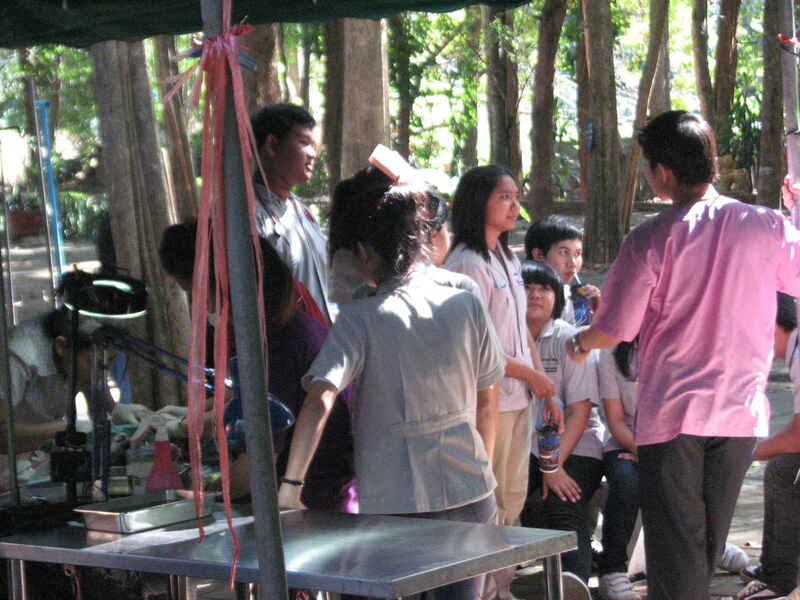 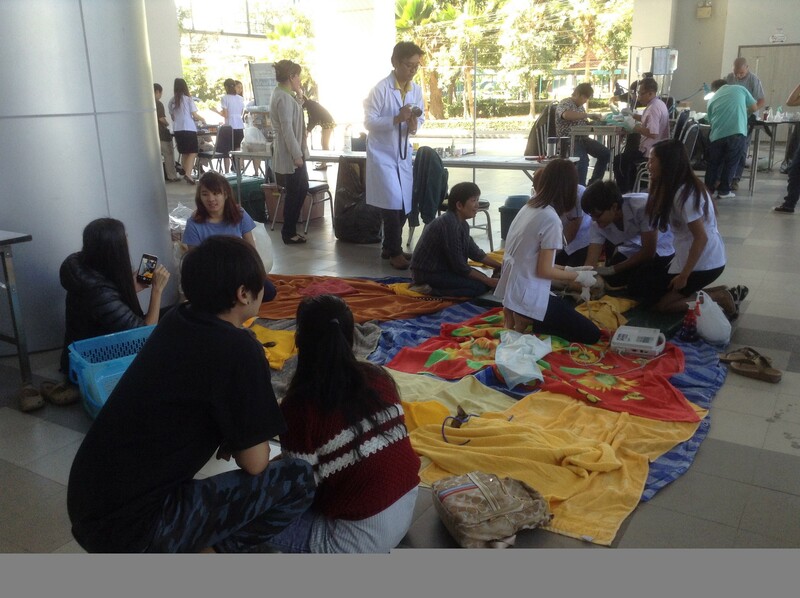 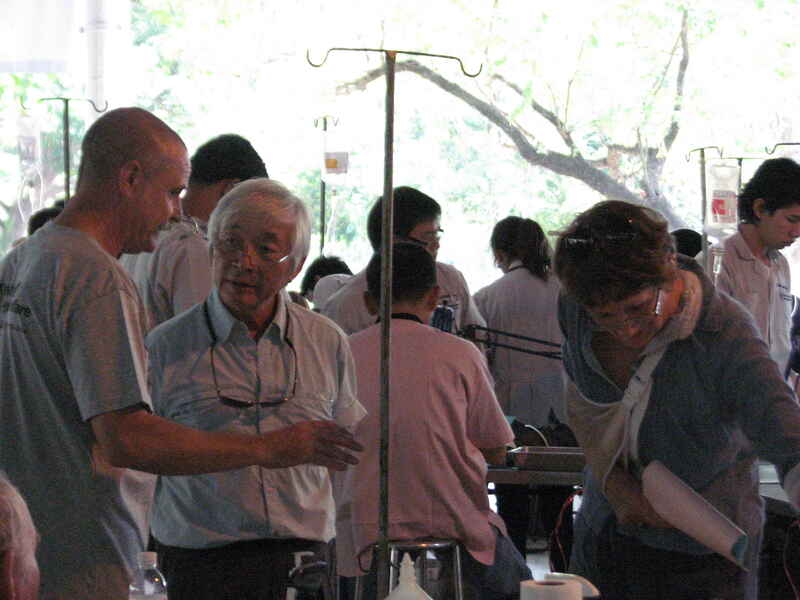 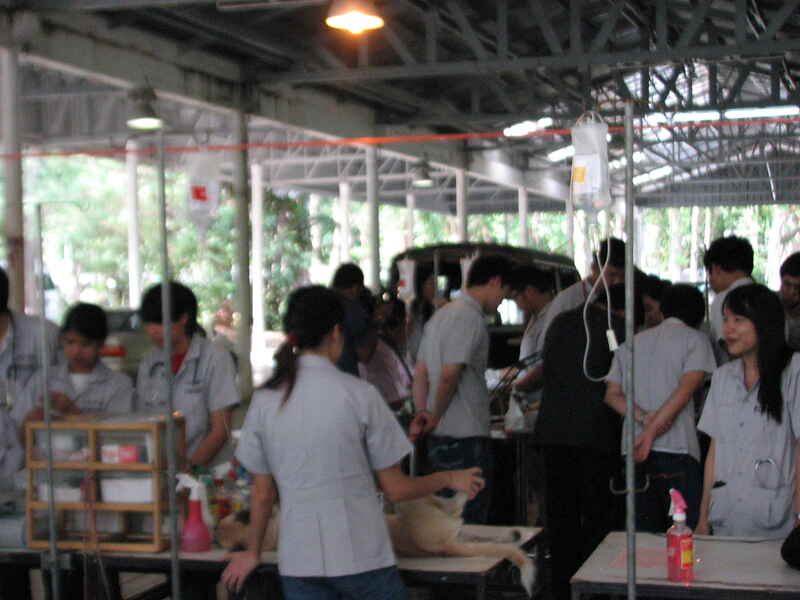 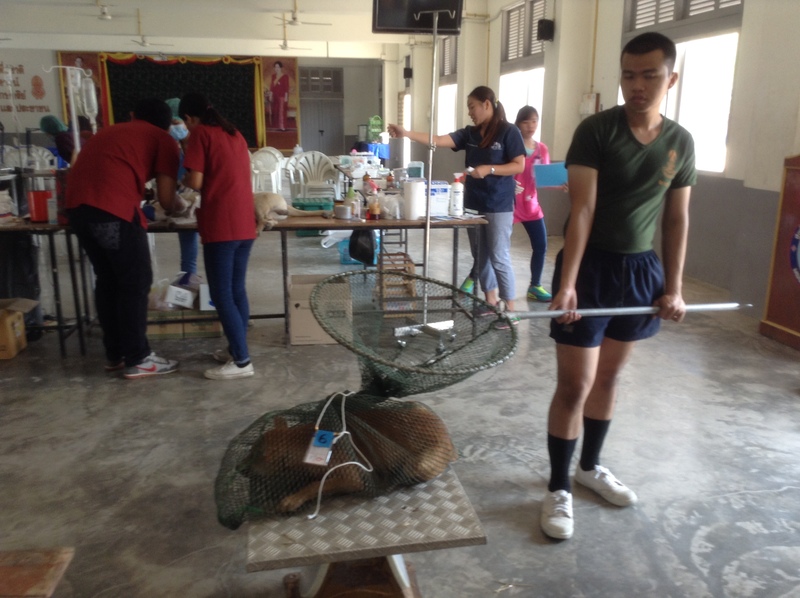 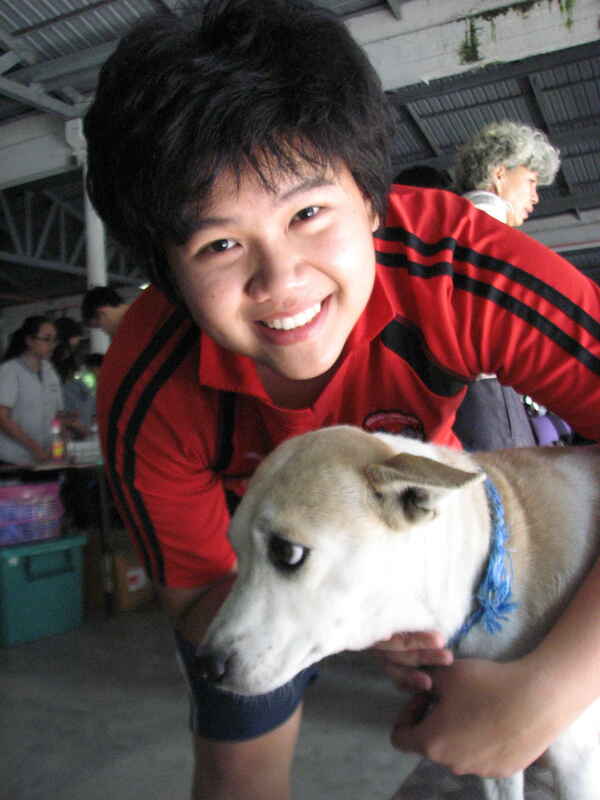 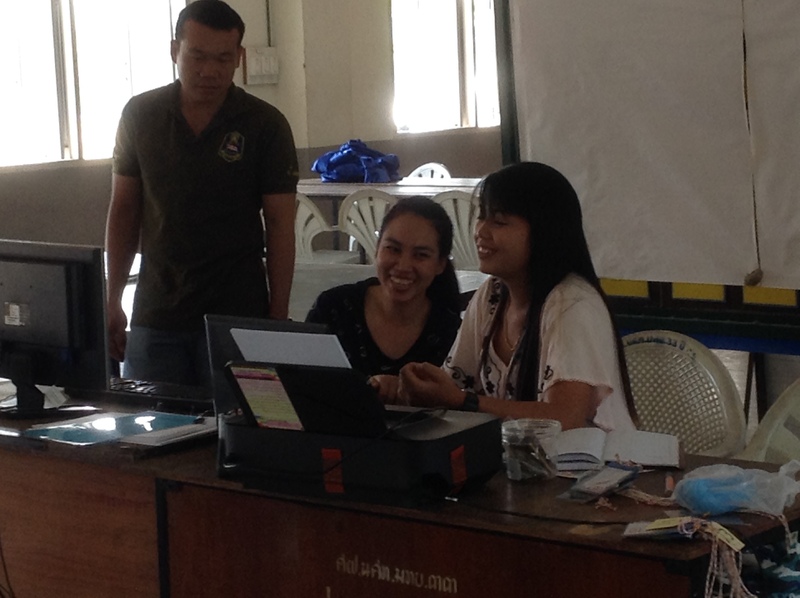 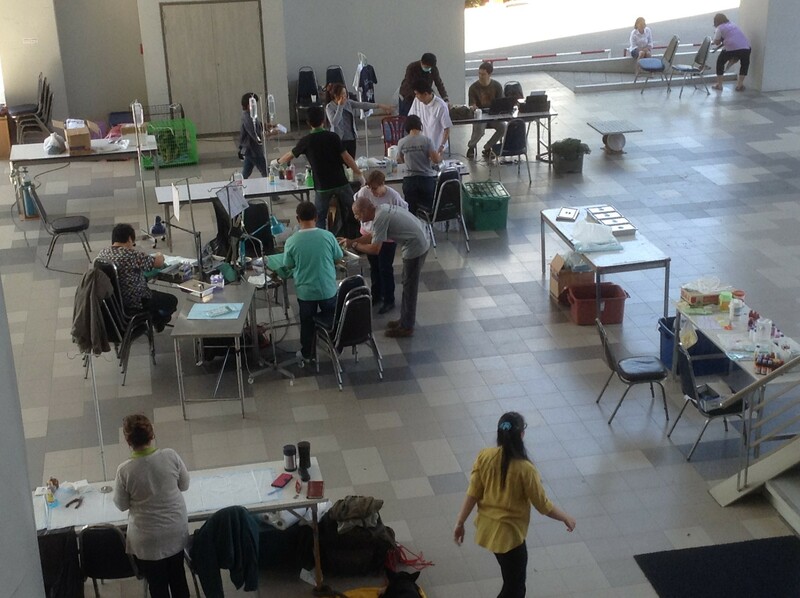 The sterilization activity at Chiang Mai University was a lot of fun last Saturday. 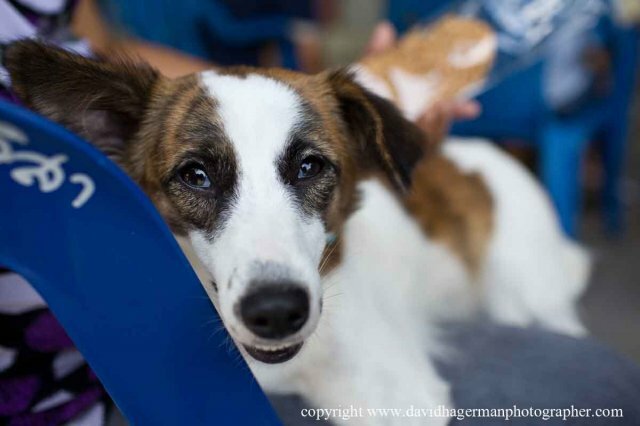 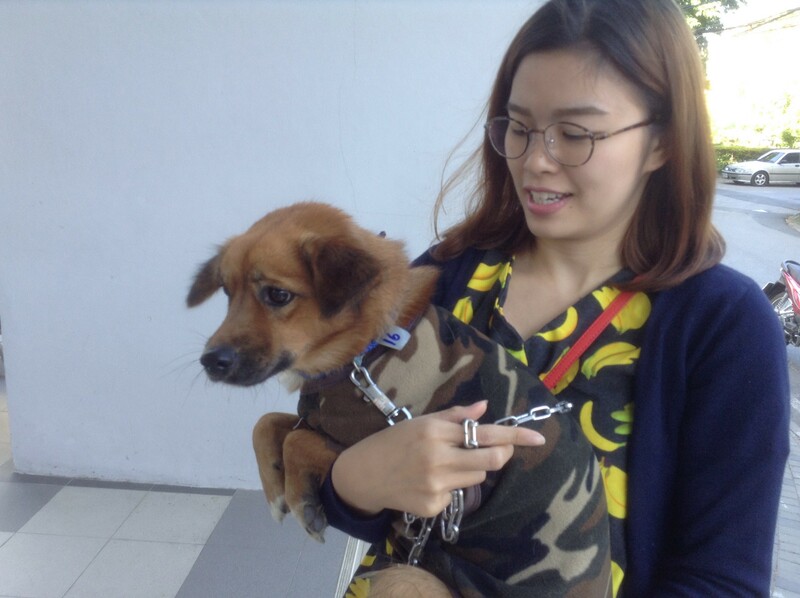 Prof Araya created a project that connected art with dogs. 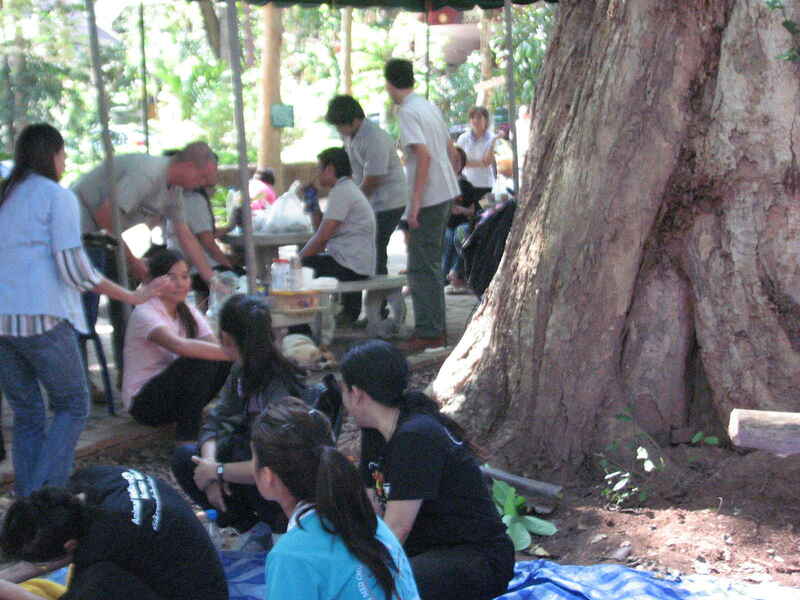 The multidisplinary art students collaborated well to do a very impressive job. 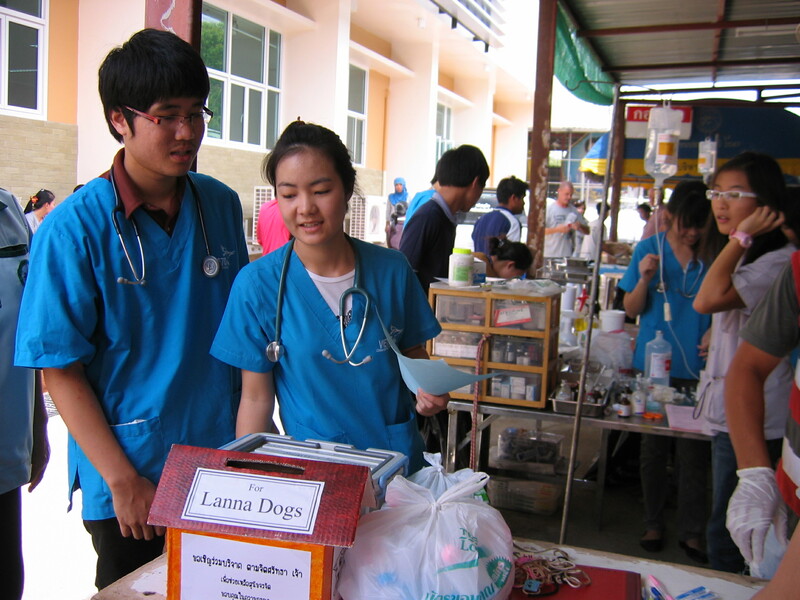 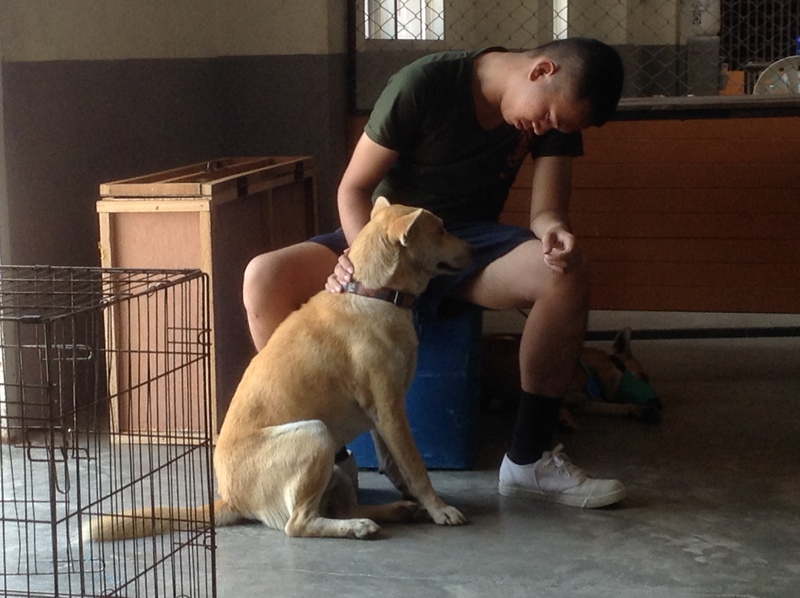 The student management was excellent in planning fund raising, catching dogs with different methods, and arranging transportation to and from sterilization areas. 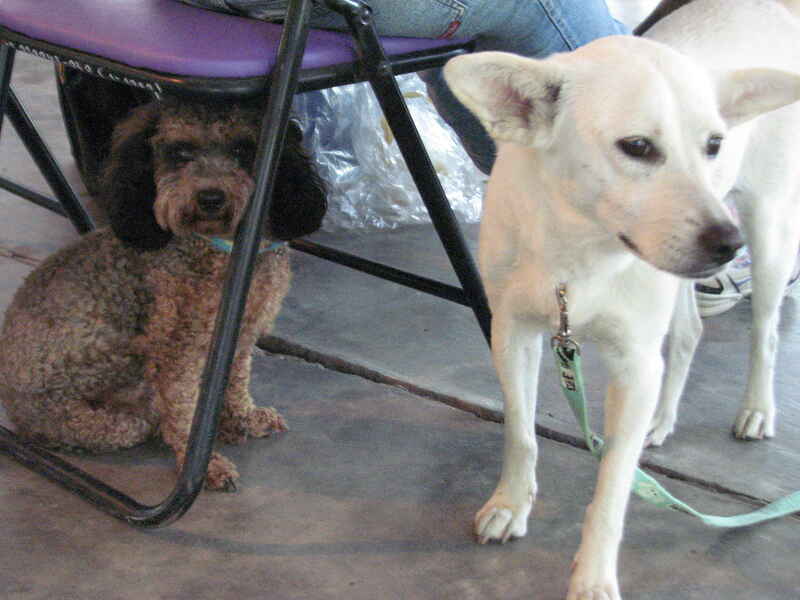 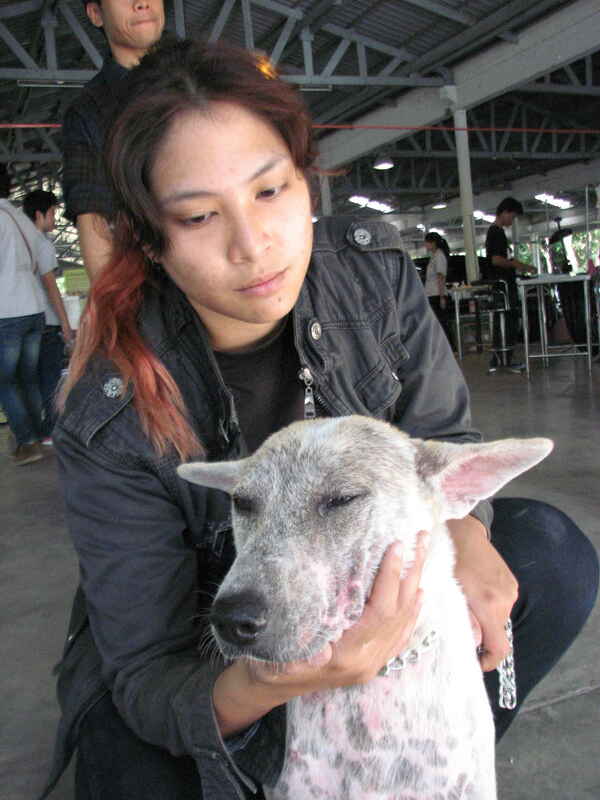 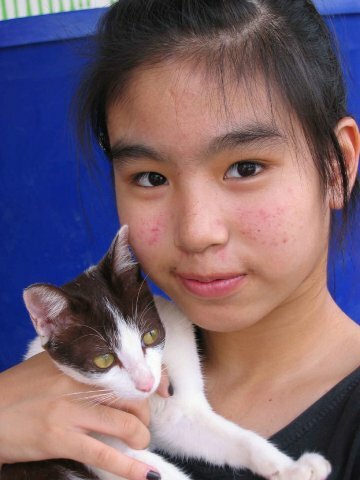 There were many sick and mangy dogs, including 28 that were sterilized and vaccinated for rabies, and the care and handling given by the students was very gentle and humane. 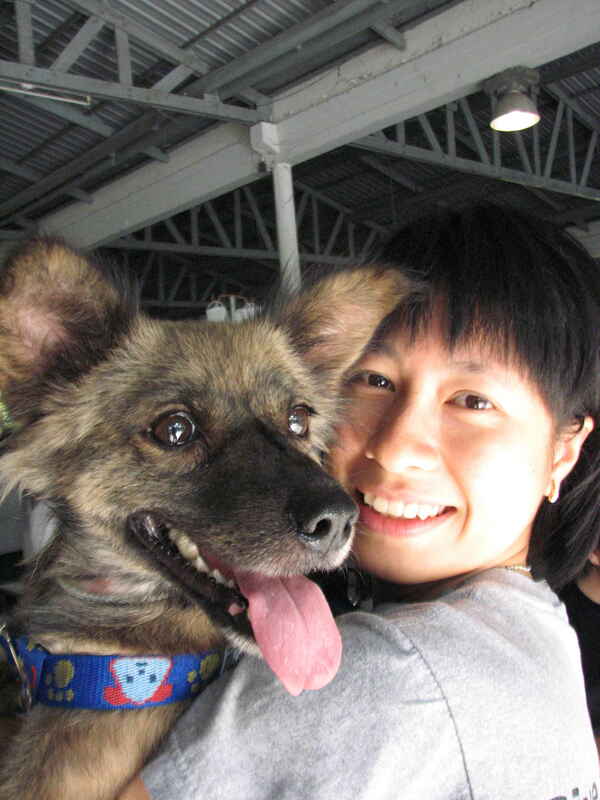 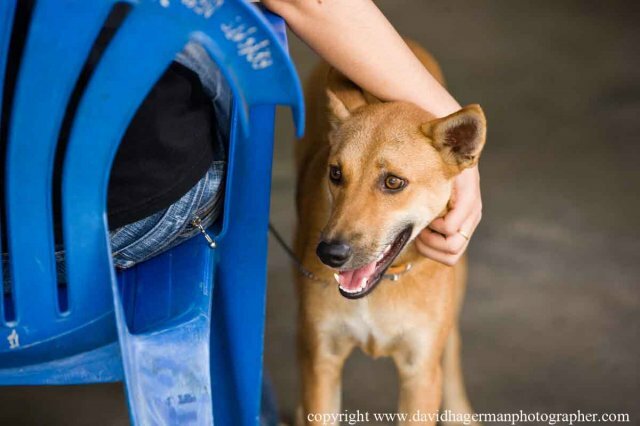 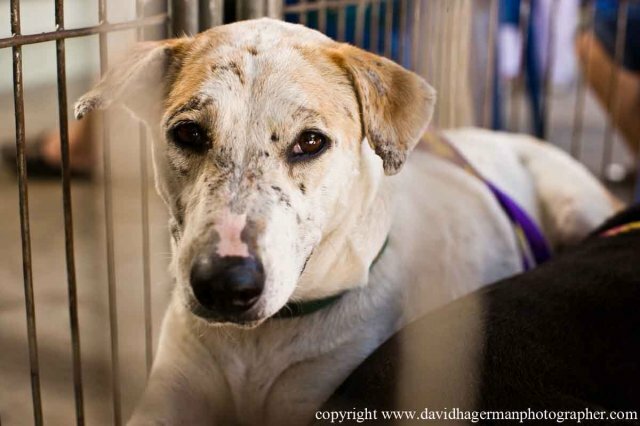 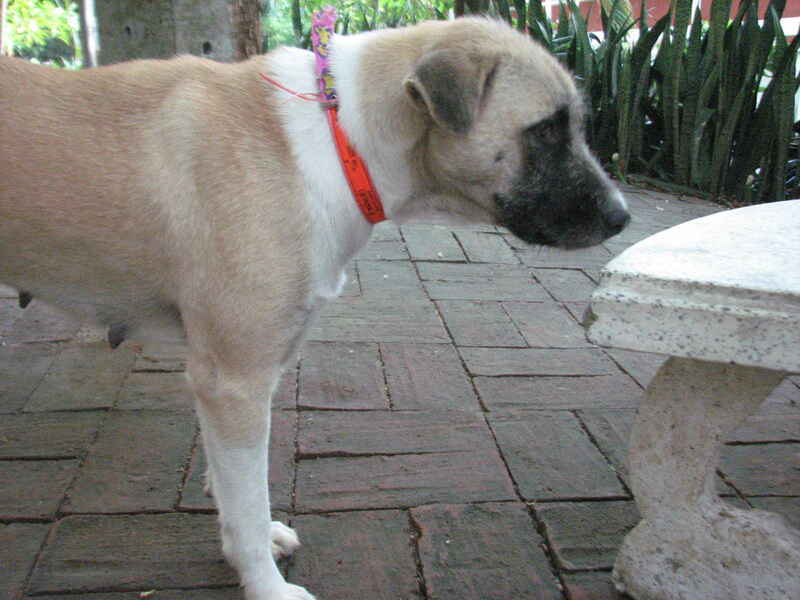 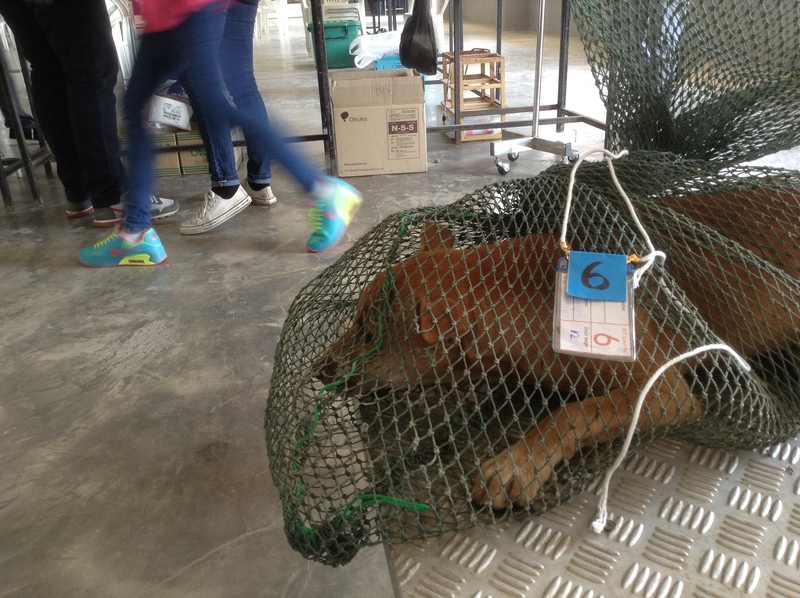 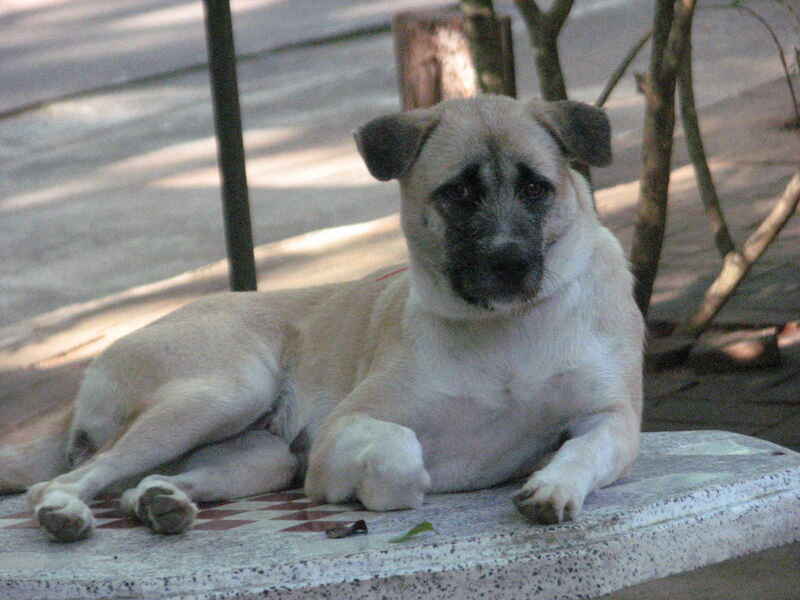 Once a dog has been sterilized and vaccinated, it will wear a red collar. 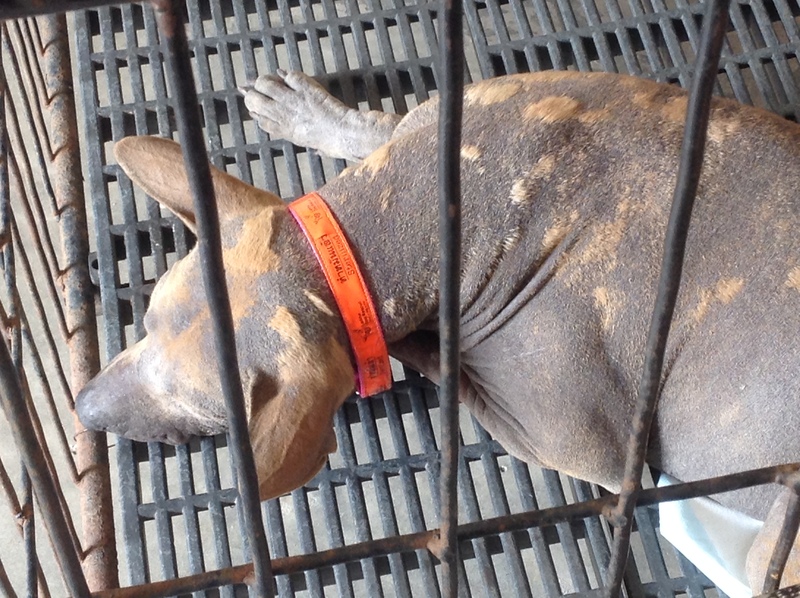 When you see a dog wearing a red collar, it indicates the success of this campaign. 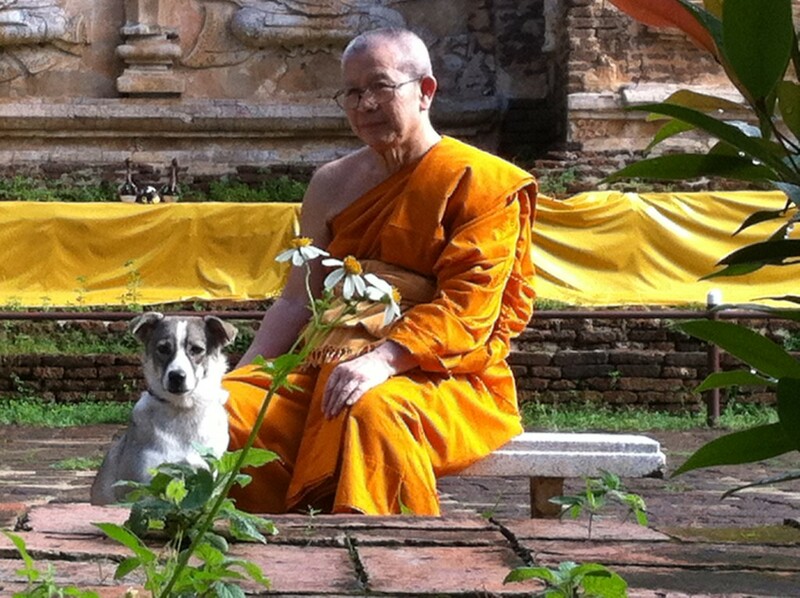 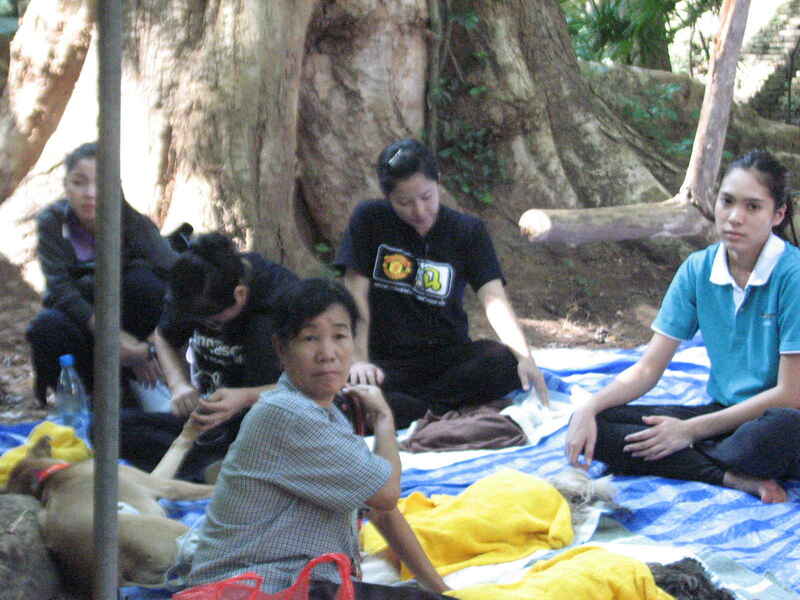 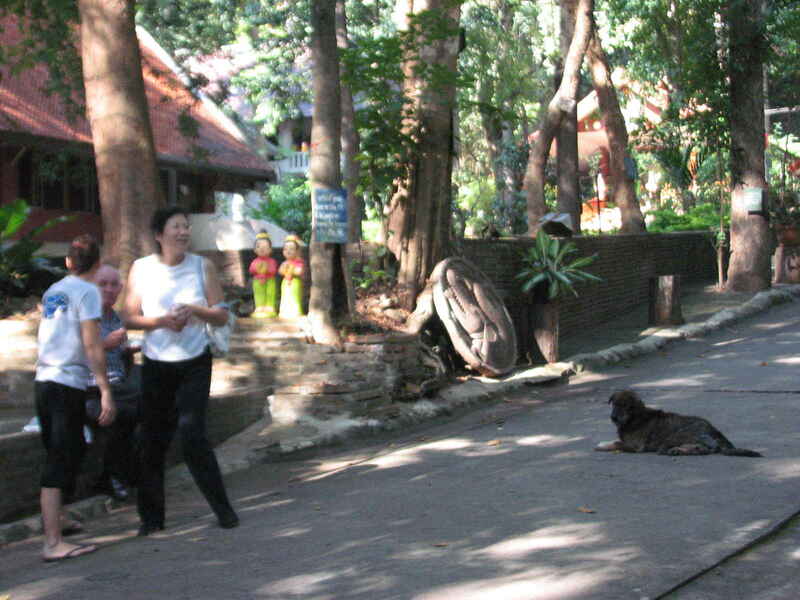 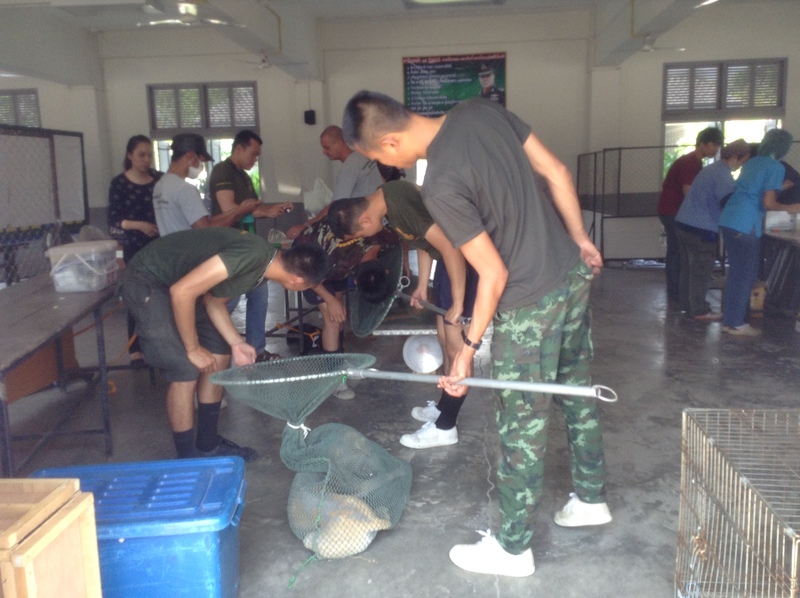 Although we were unable the catch many dogs at Wat Umong, it turned out to be a peaceful and relaxing sterilization activity, performed around the speaking trees, fish pond and chickens that live in perfect harmony. 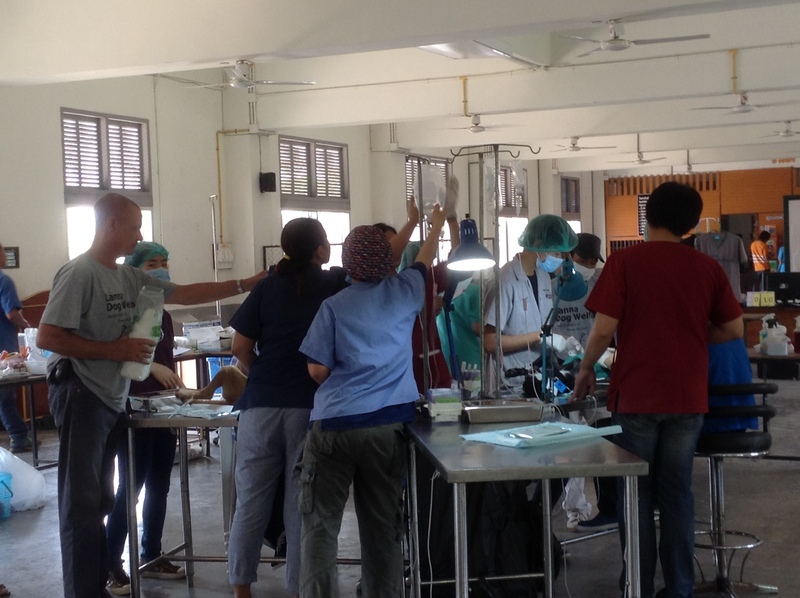 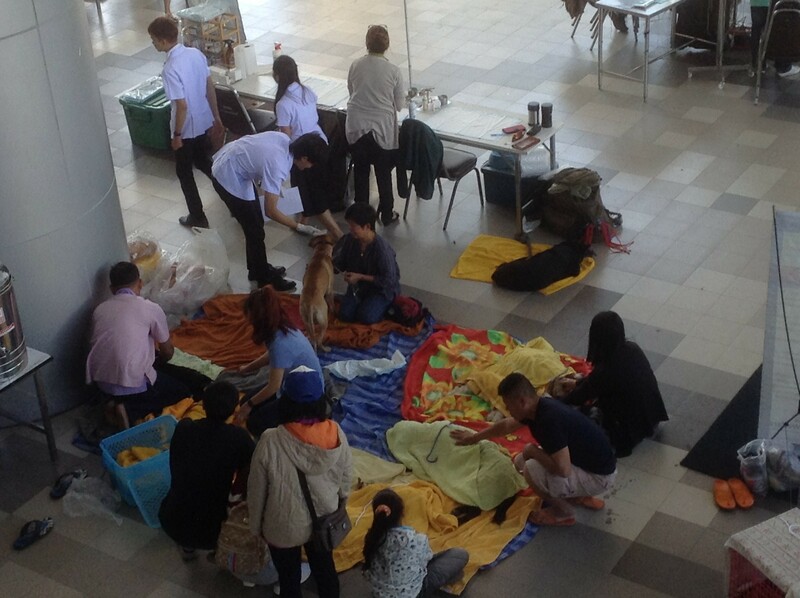 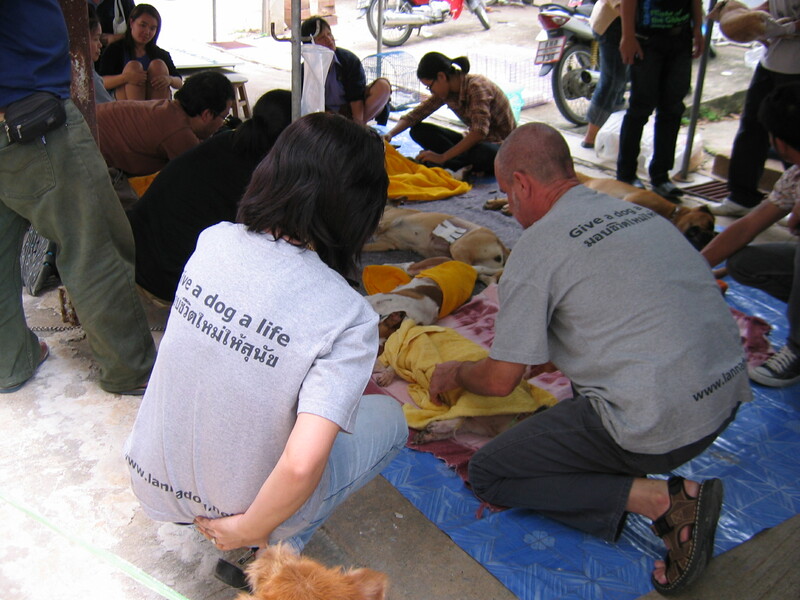 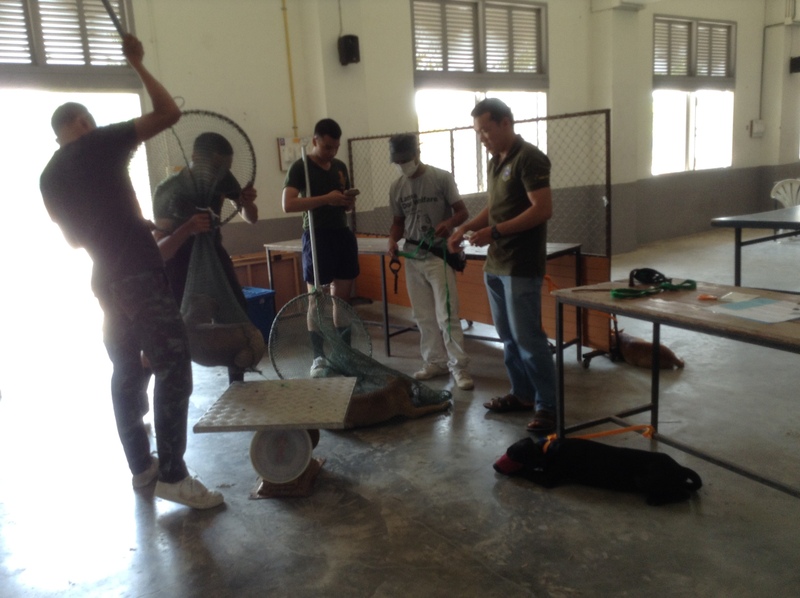 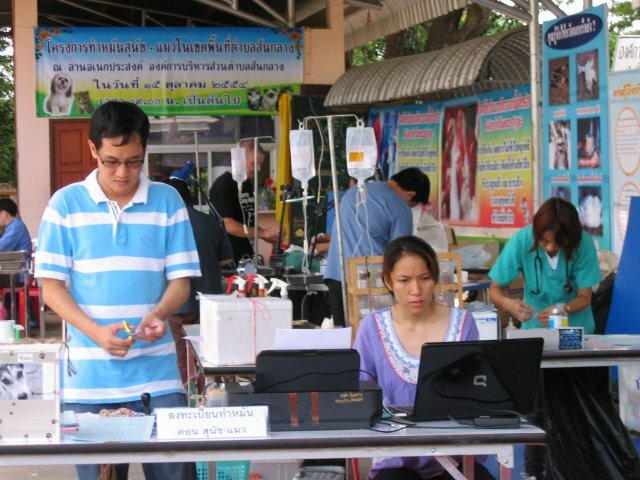 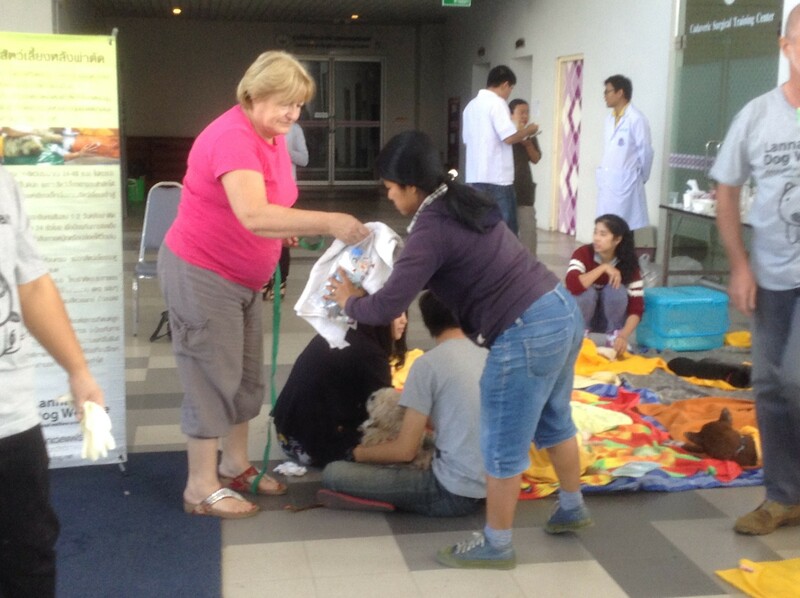 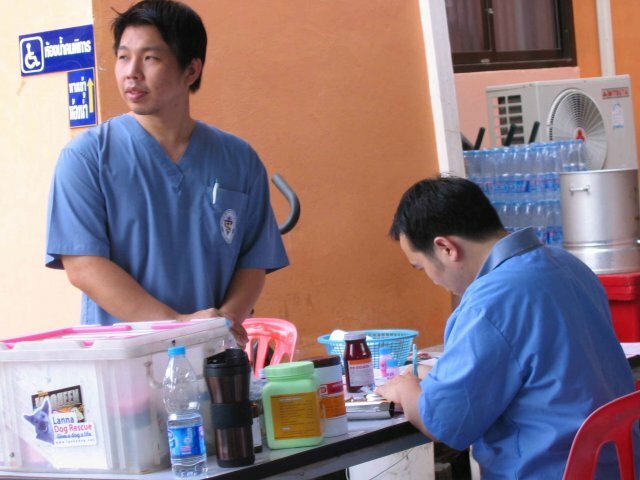 The vets, students, and volunteers outnumbered the dogs and cats being sterilized. 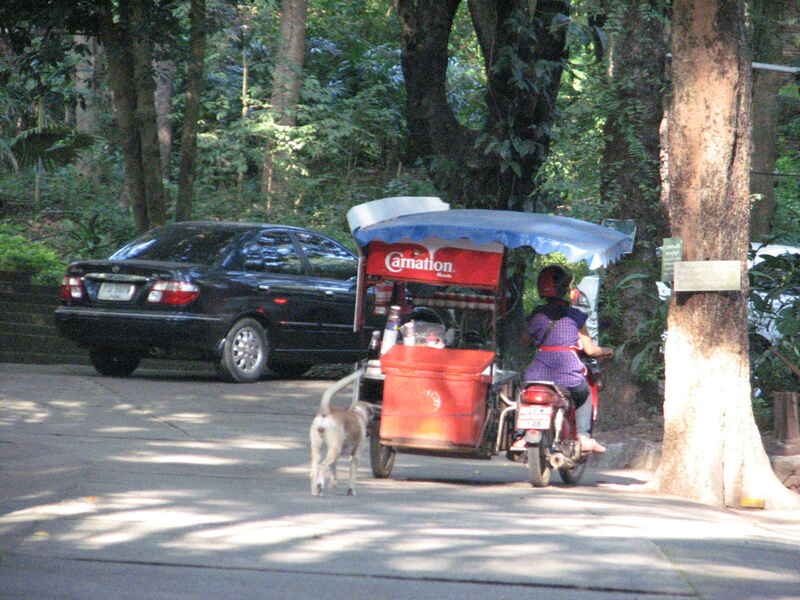 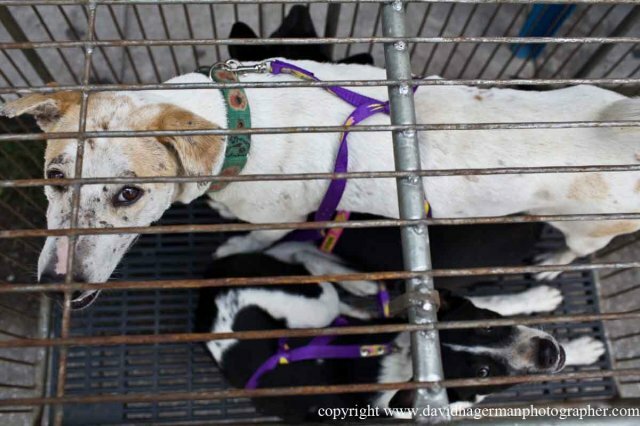 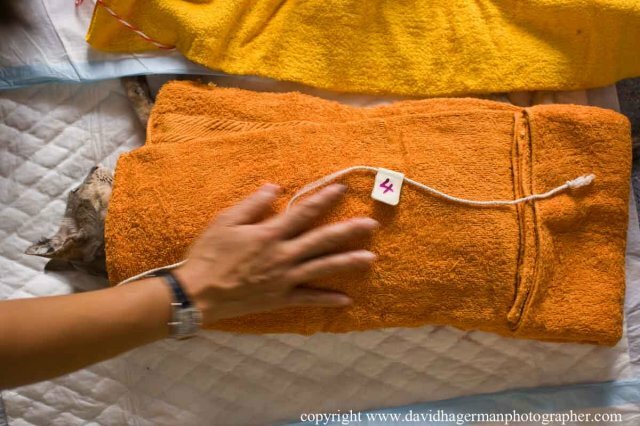 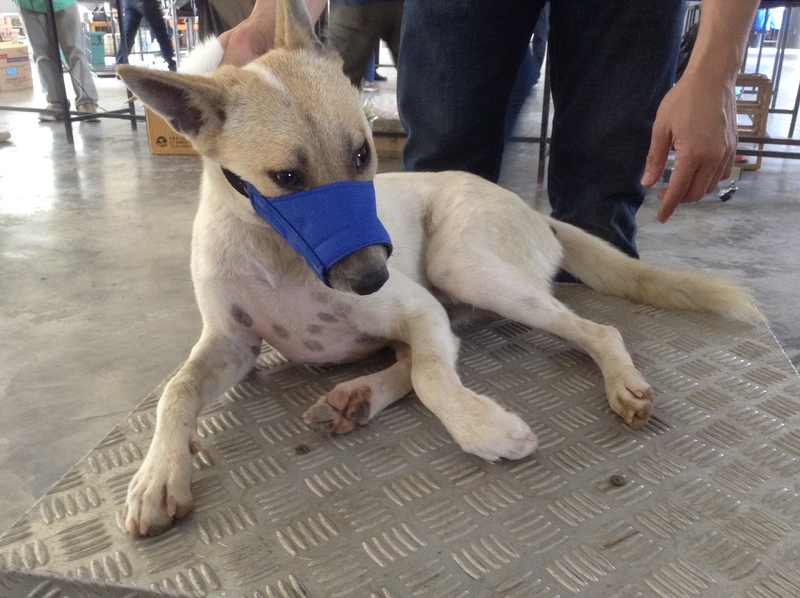 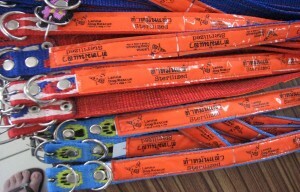 Sterilized dogs wore a red collar to indicate that they were sterilized and had received rabies vaccination. 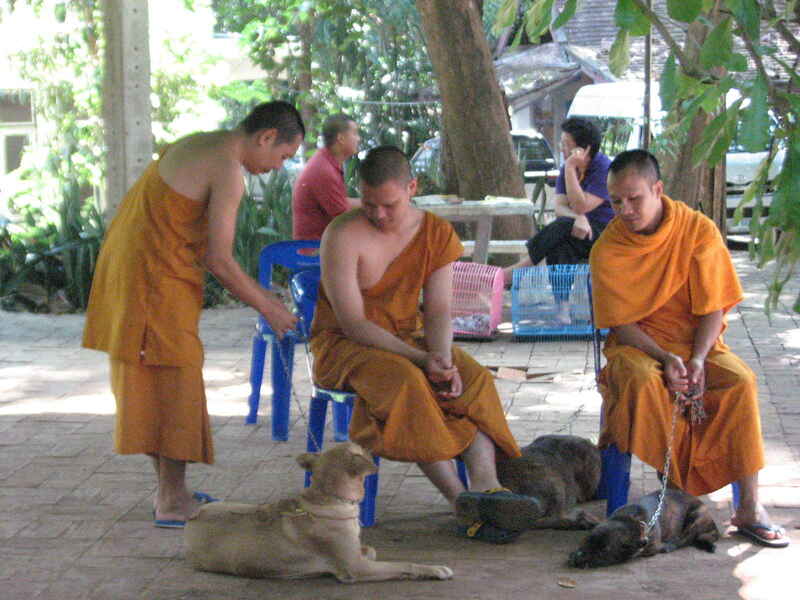 This temple is very famous for meditation and harmonious environment, and can be recommended to anyone seeking peace and tranquillity. 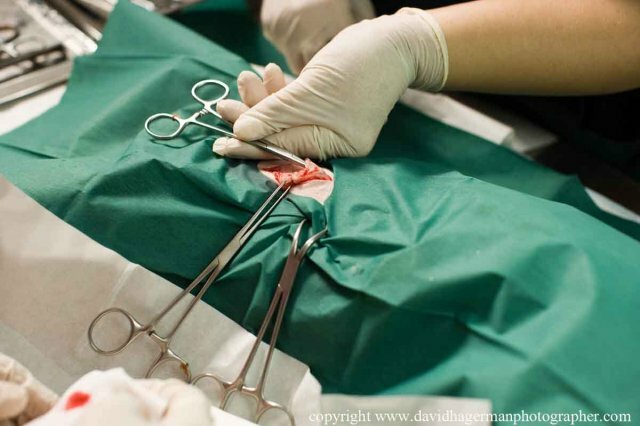 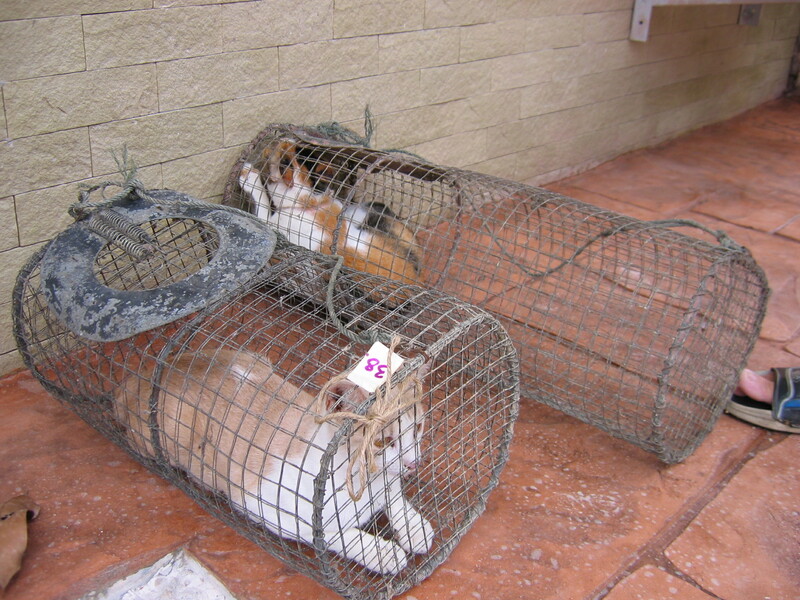 We often have a problem with cats, which are brought to us for sterilization. 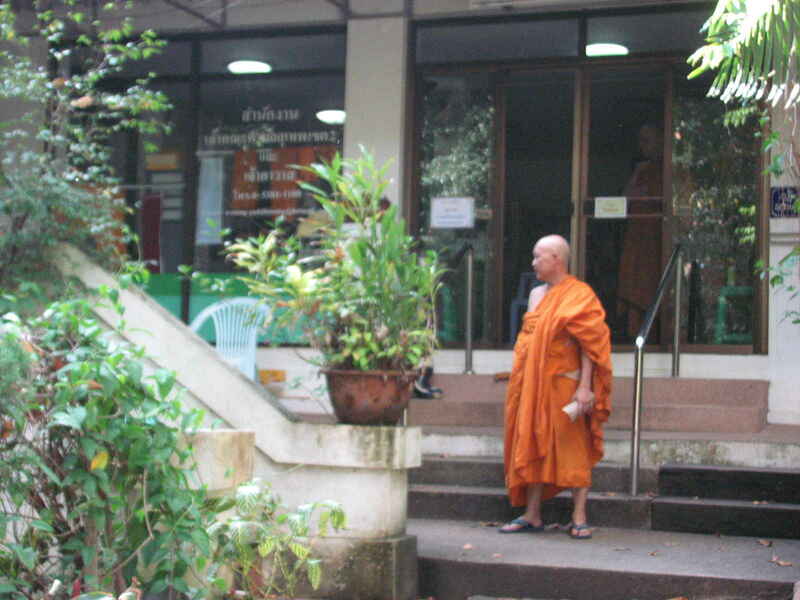 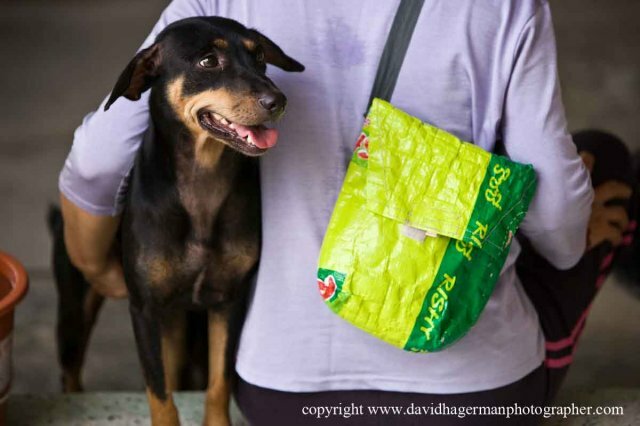 The communities often bring them in fertilizer bags or sandbags and not in cages. 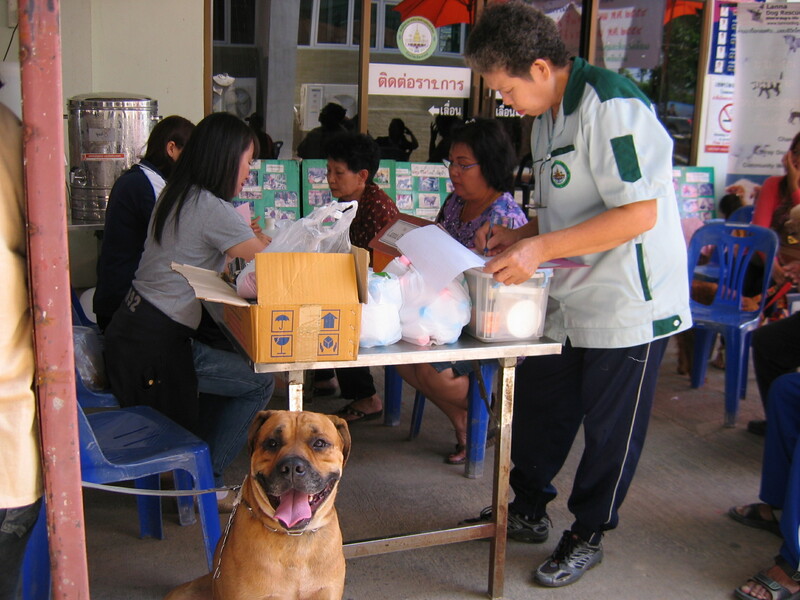 It is difficult to photograph for Pet ID, and check health and weight, because they often become anxious and jump away when the bag is opened. 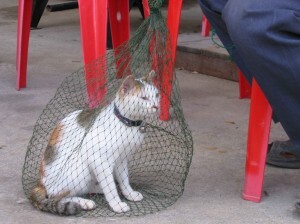 Apart from a cage, the cat can be carried in a fishing net, which is practical for animal welfare. 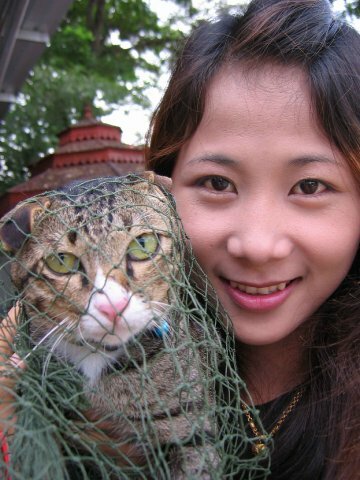 It is easy to handle and the cats stay relaxed with their owner. 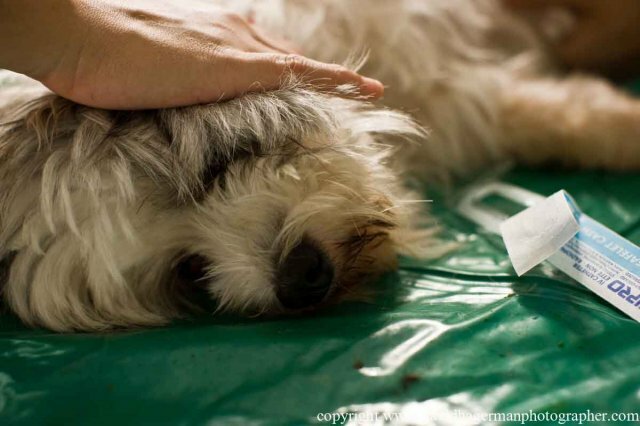 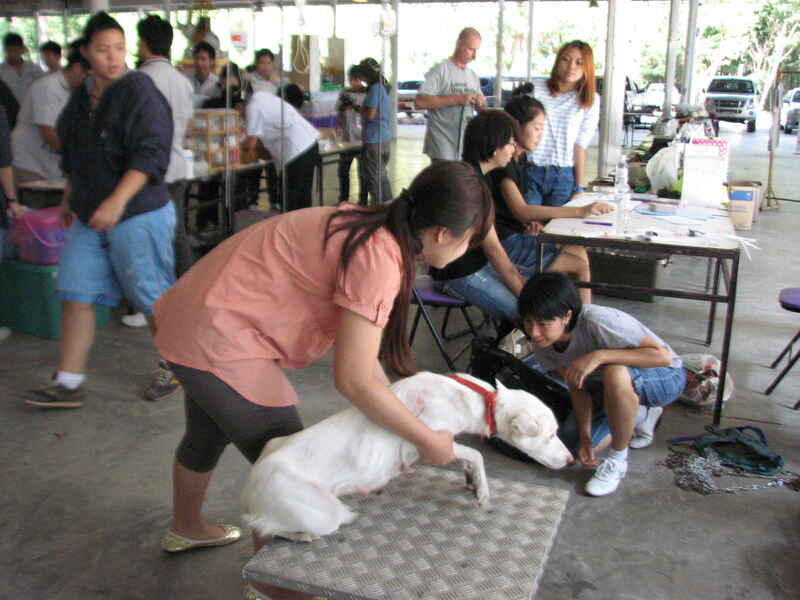 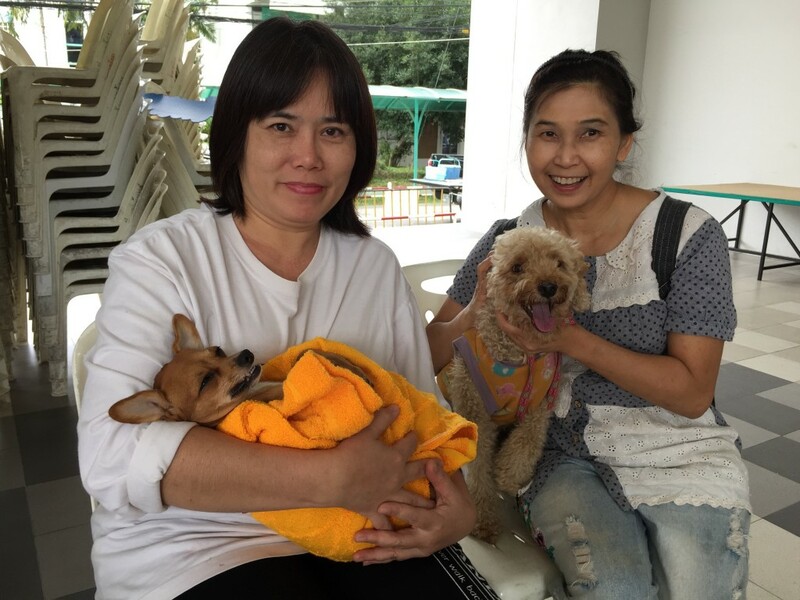 Pets might join in village activity, such as special ceremonies, so few animals came to us, but 18 were sterilized at San Klang sub-district last Saturday. 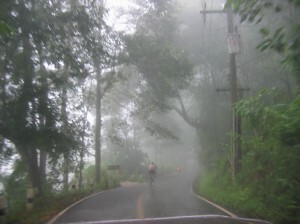 Despite misty weather, it was a nice day. 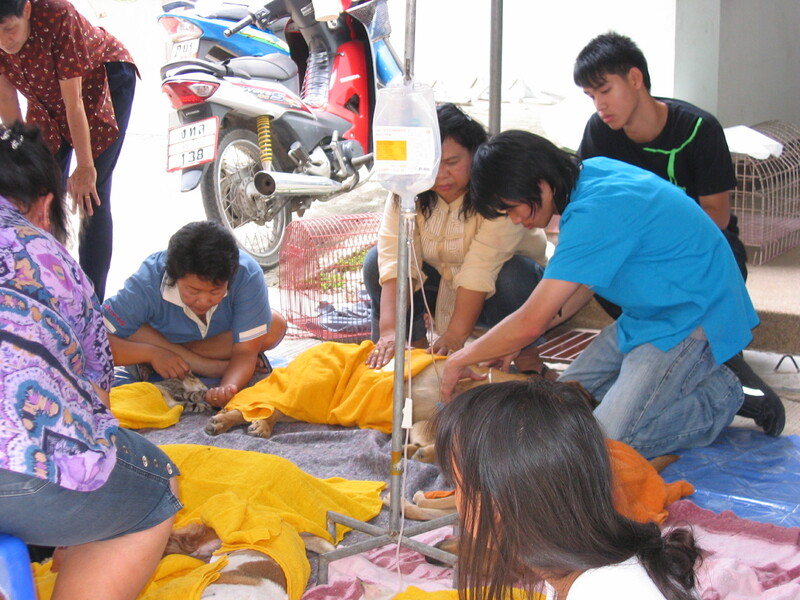 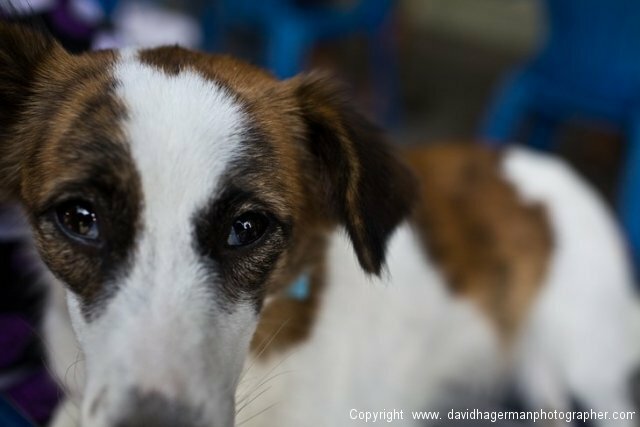 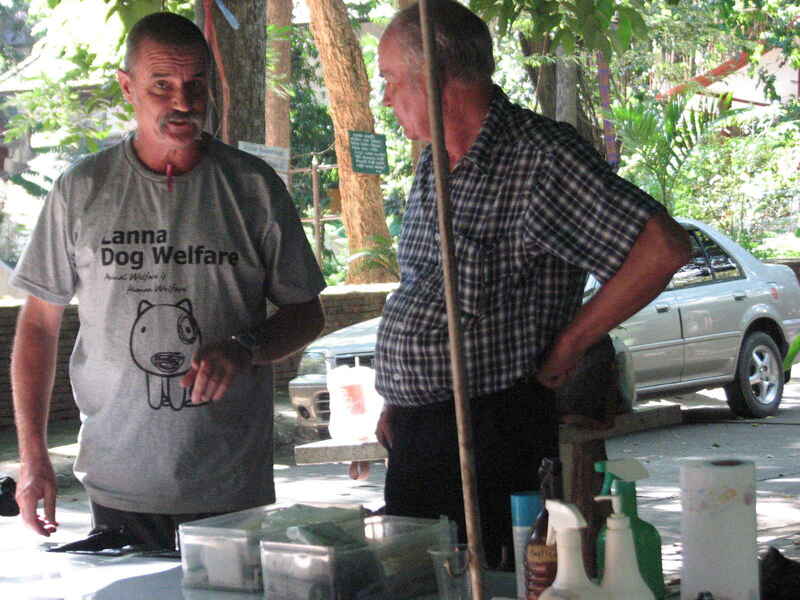 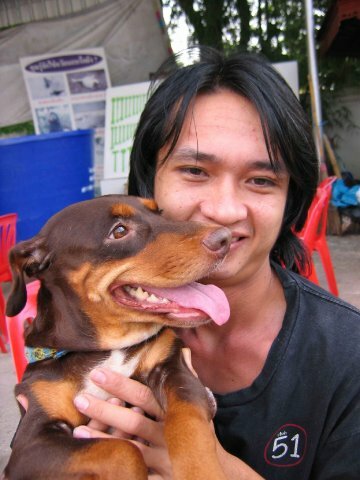 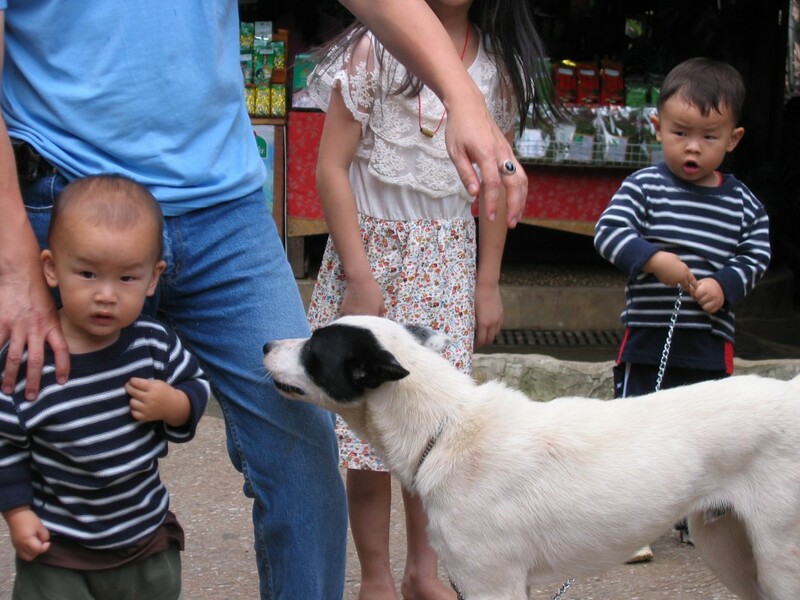 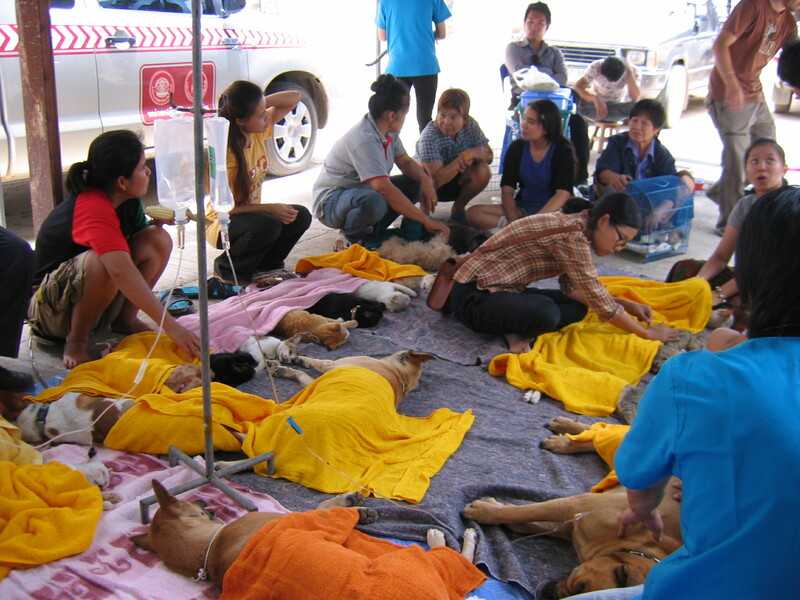 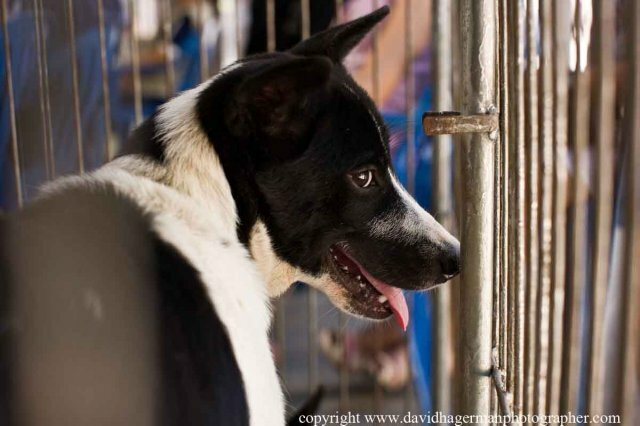 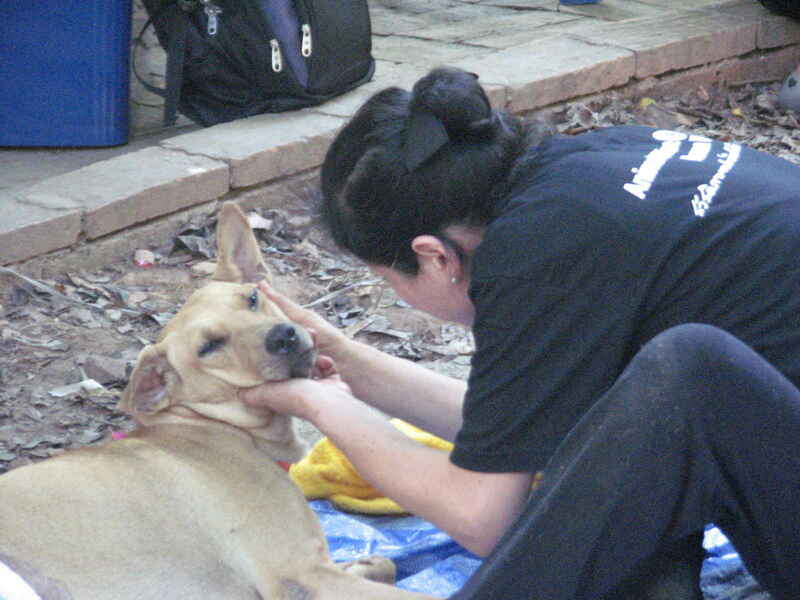 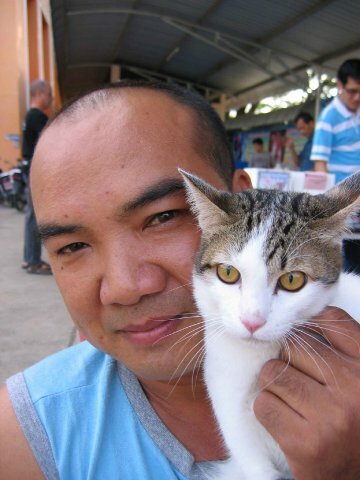 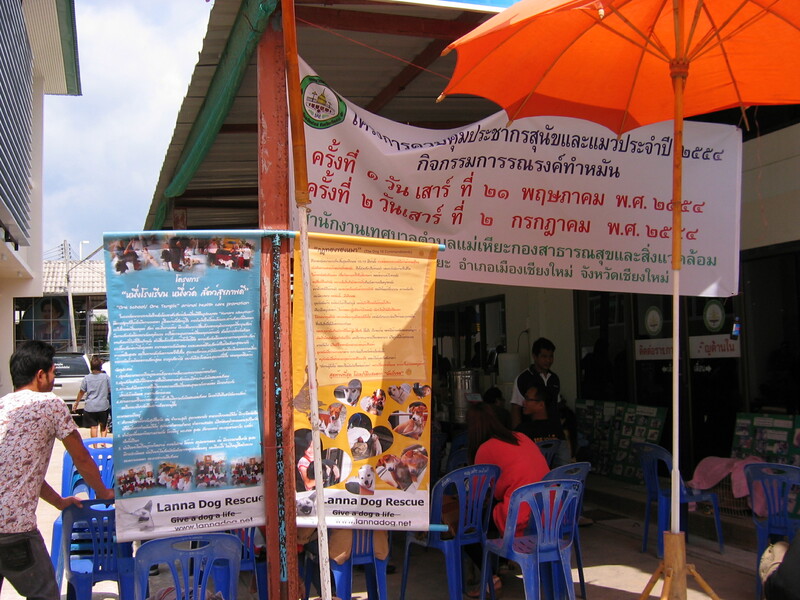 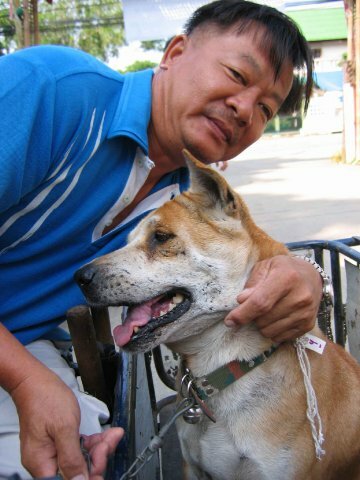 Only 13 dogs and cats were sterilized, but everybody was happy including the Mhong villagers. 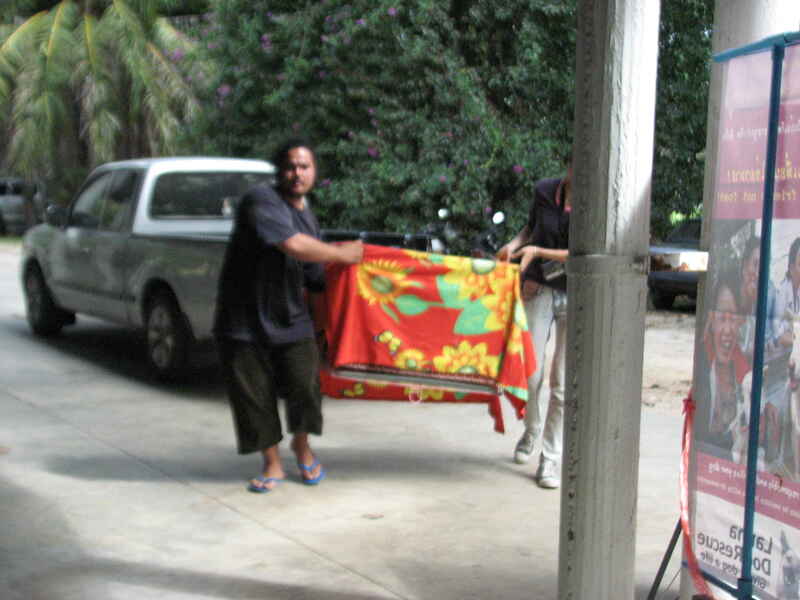 This was the first time they received this service. 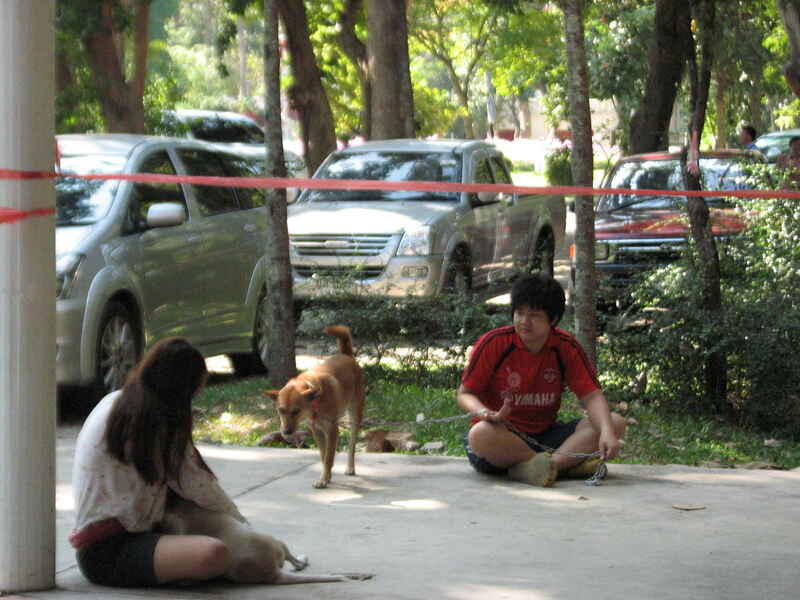 How nice it was to have photographs of them with their pets, and the Pet ID will be brought to them later. 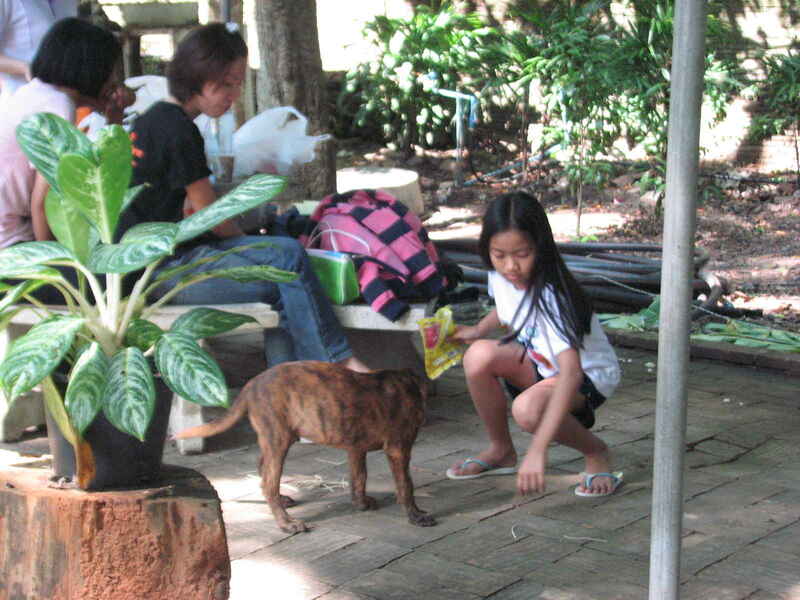 The animals in the village were well looked after and healthy compared to urban pets. 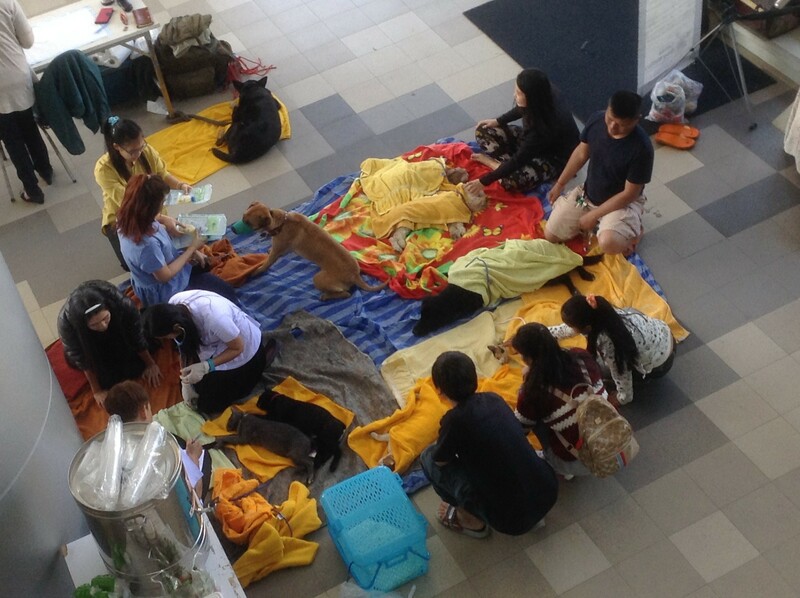 More animals would have been brought for sterilization if this event was advertised better. 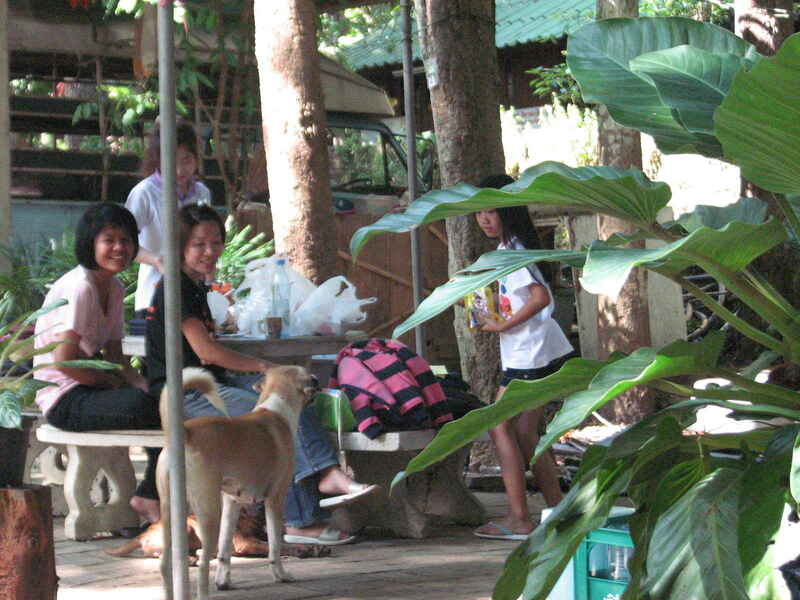 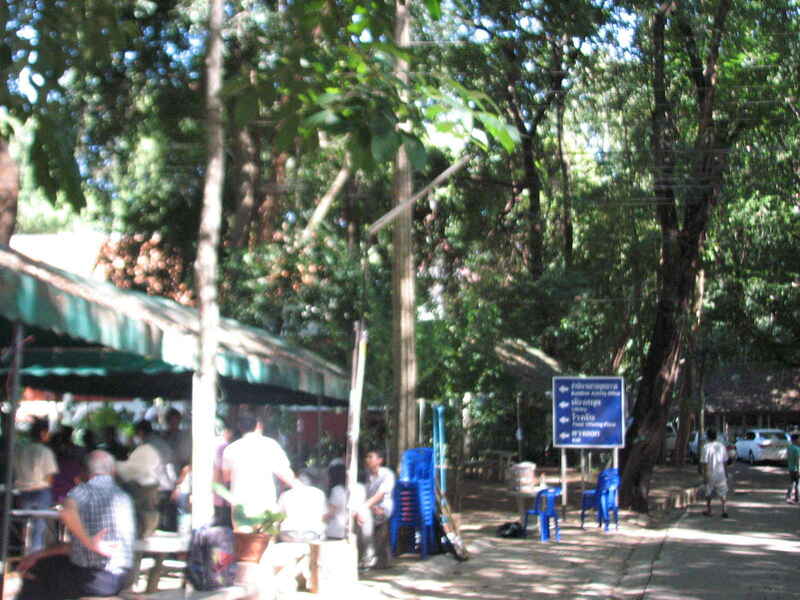 Many of the villagers and animals work on the farms and in the forest. 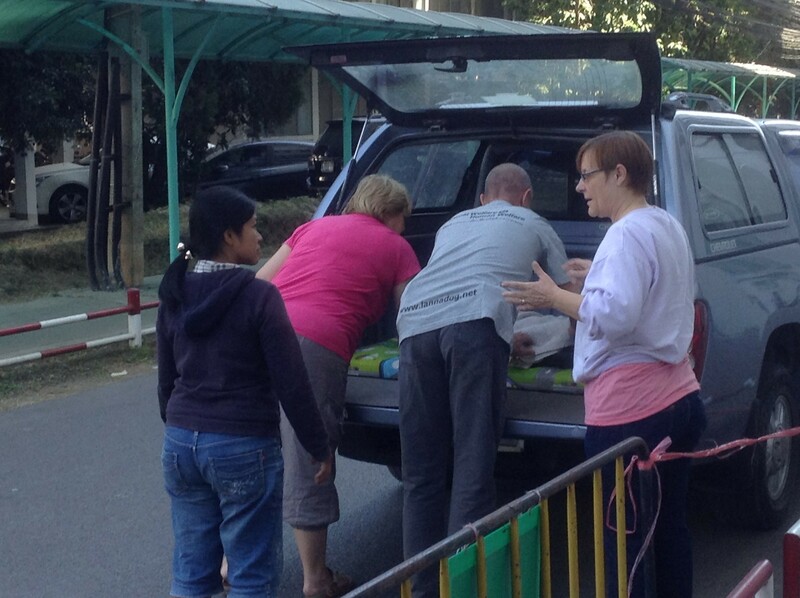 Well, 2 pigs, each weighing 60 Kgs were sterilized at home because the little girl owner could not carry them to us. 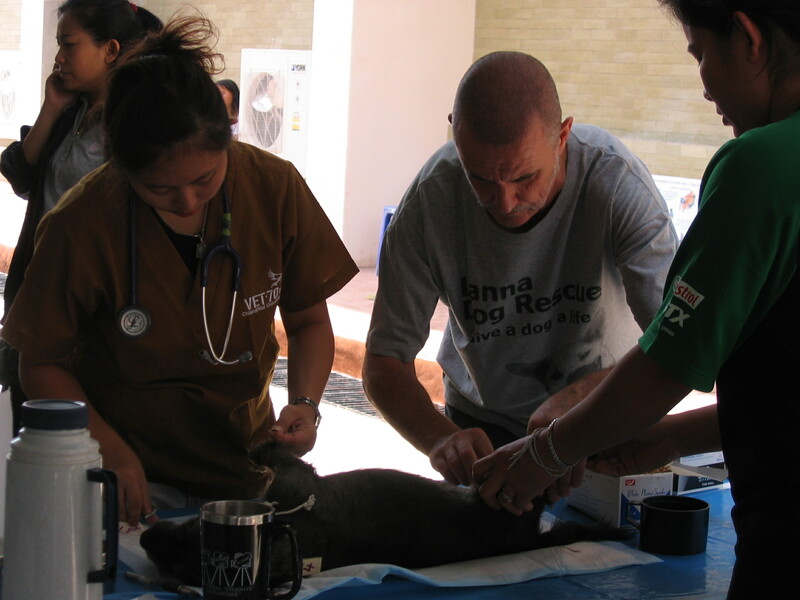 This time we had more vets and volunteers than animals. 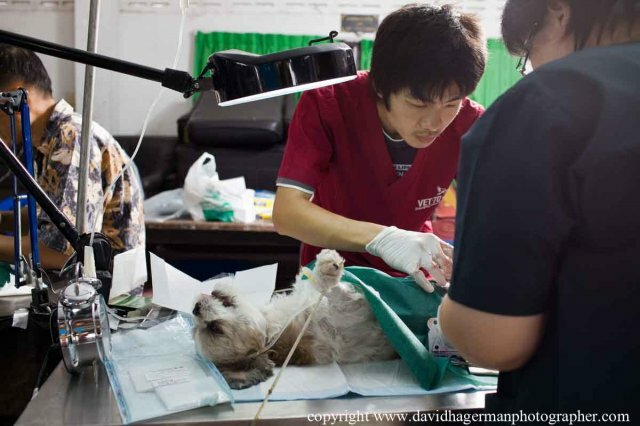 Sterilize one dog can prevent about 20 puppies a year. 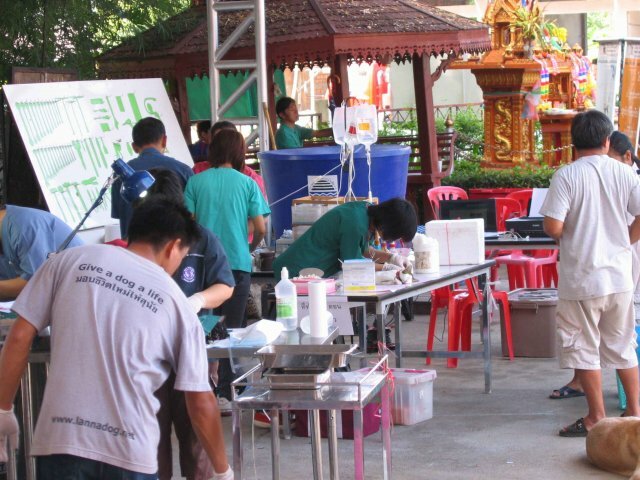 Field sterilization at Mae-Hia sub-district municipality on 21.5.11. 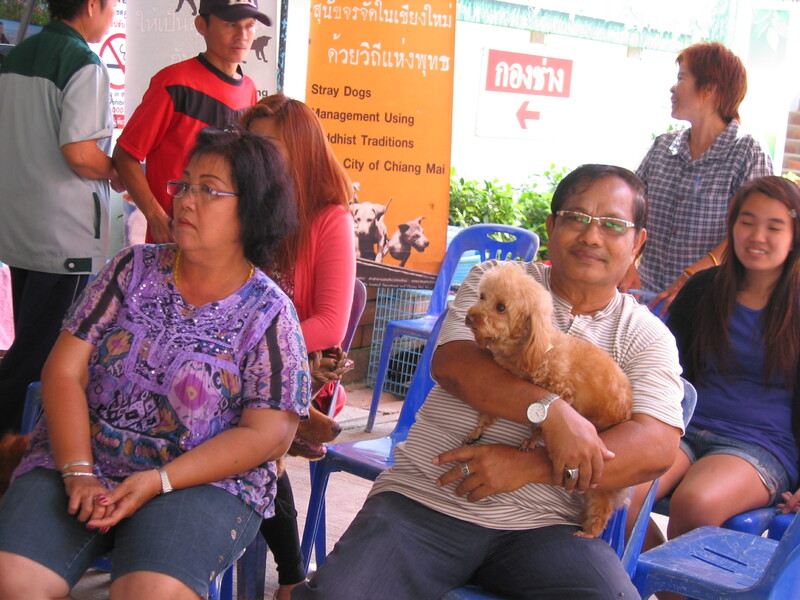 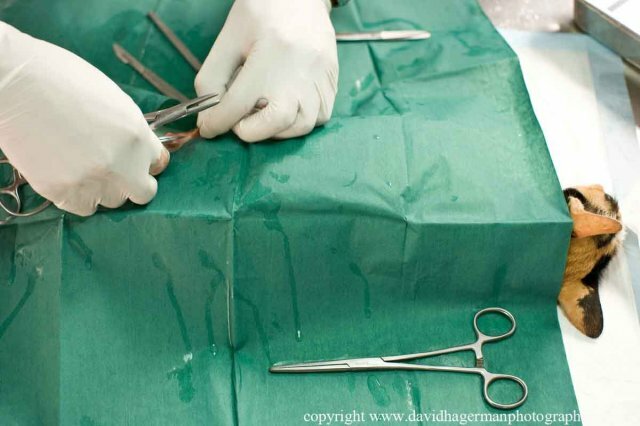 Fourty six dogs and cats were sterilized. 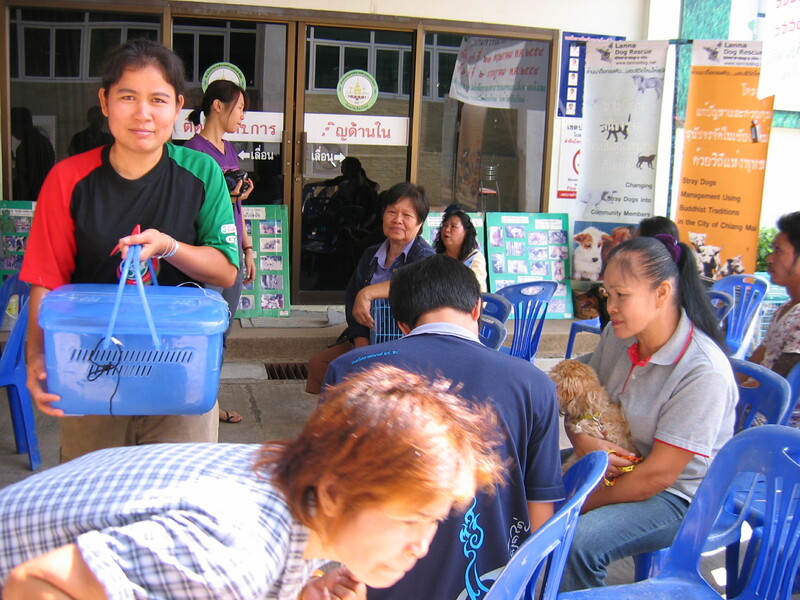 Vendors at the hospital cafeteria became upset when one of the stray cats they look after suddenly disappeared. 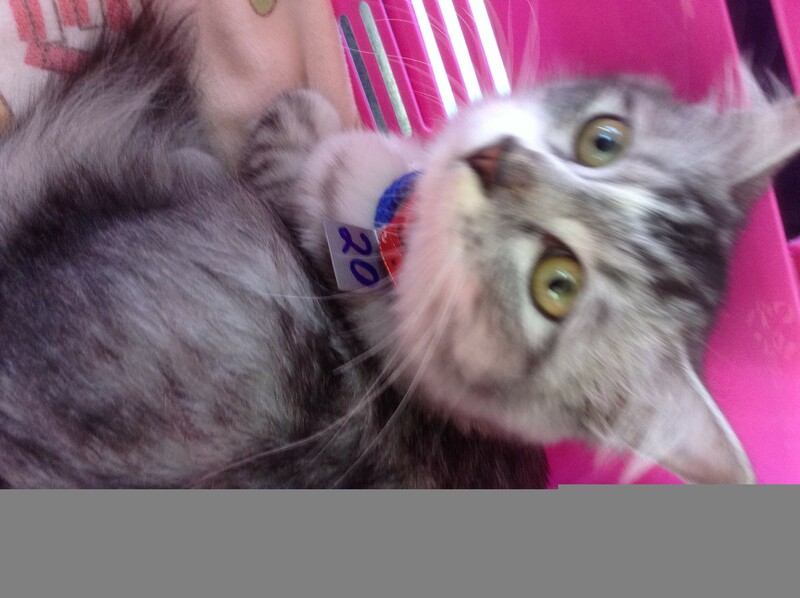 A female customer, who showed some interest in the cats, was suspected of stealing the missing animal. 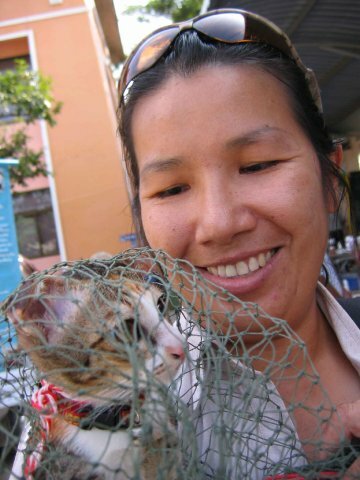 “She should have told us that she wanted the cat!” said vendors. 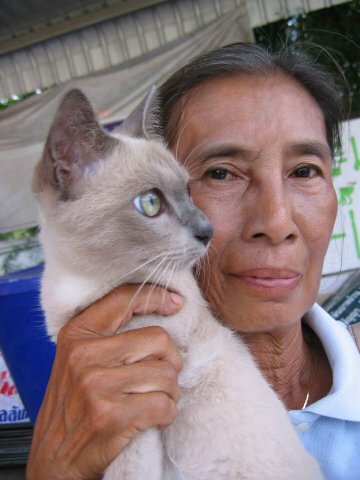 They went on to say, “We have fed our cats since they were skinny and we told the woman that all the cats here were sprayed yesterday. 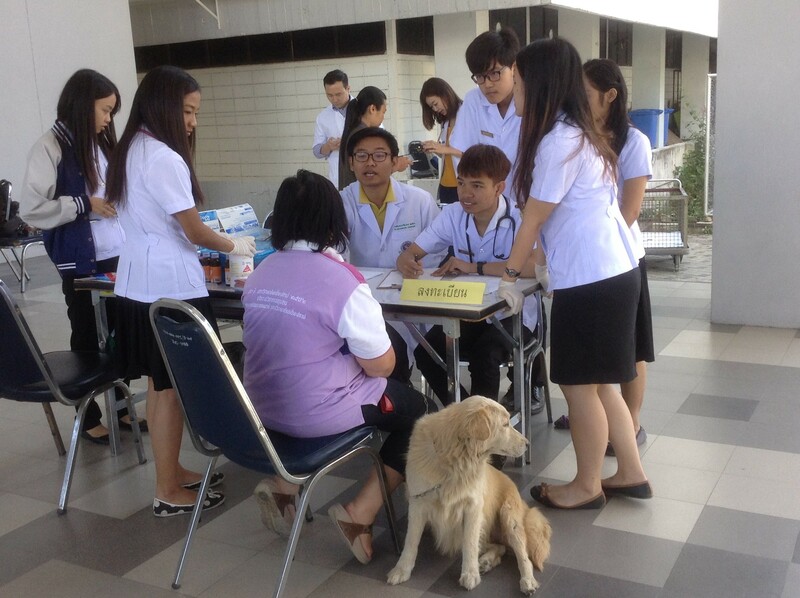 The cat in question was one of four that had been brought to Lanna Dog Rescue field sterilization project organized by Lanna Dog Rescue and the Faculty of Medicine. 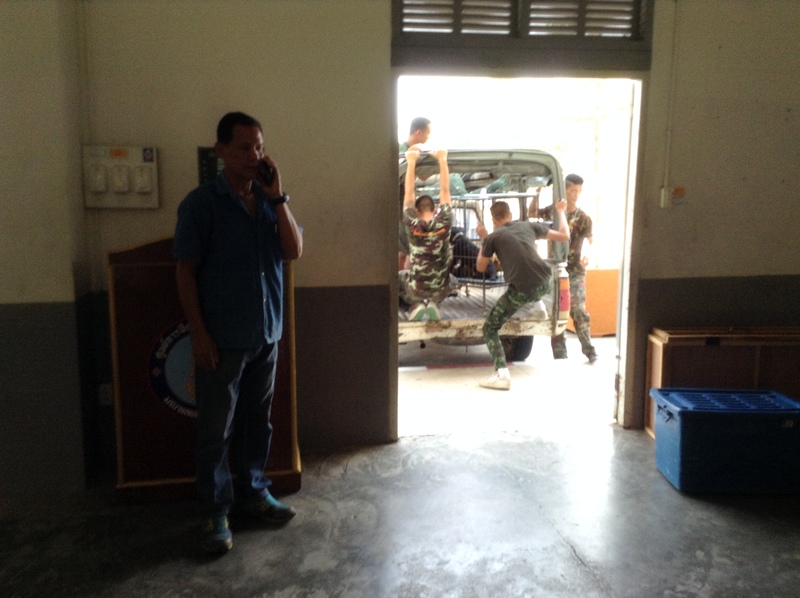 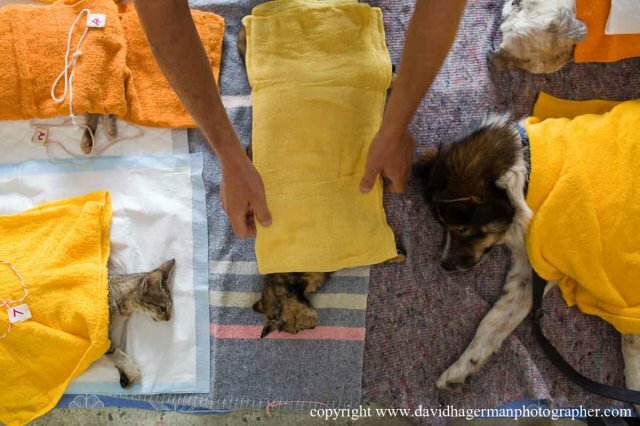 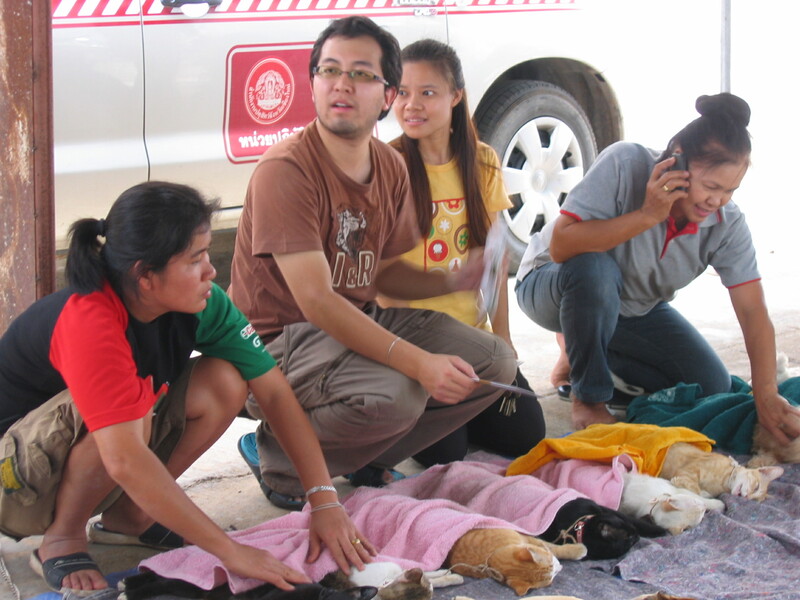 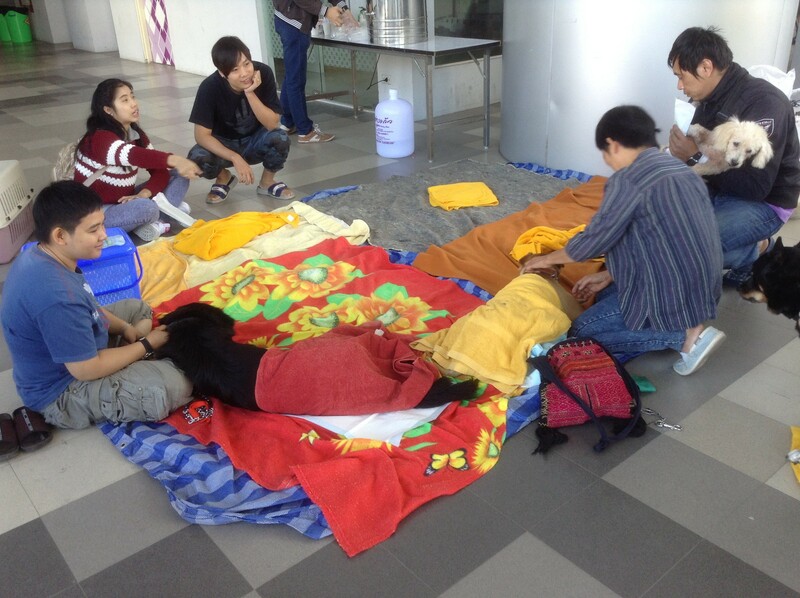 The three remaining cats had been taken care of by vendors and hospital personnel. 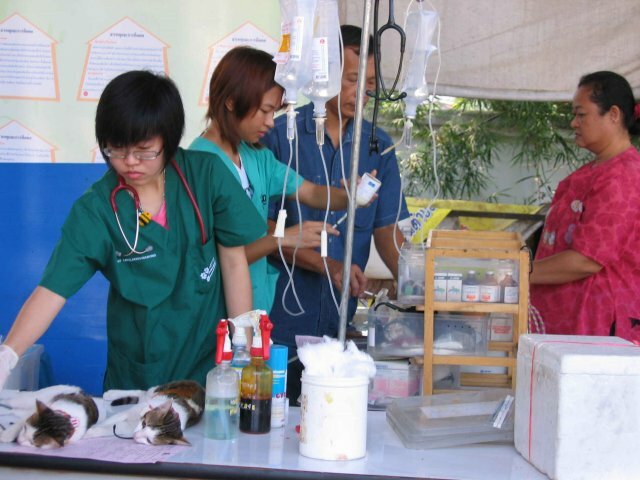 A nurse and her daughter climbed some stairs to catch a day-old freshly sprayed cat for antibiotic administration, while the remaining cats lay quietly among apples and oranges on the fruit stall. 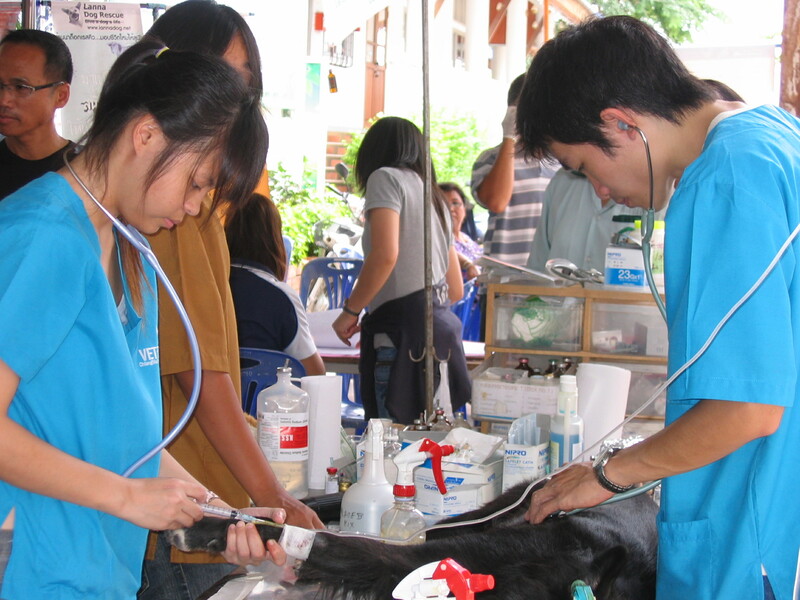 The cat spaying operation was successful, except for one cat going missing. 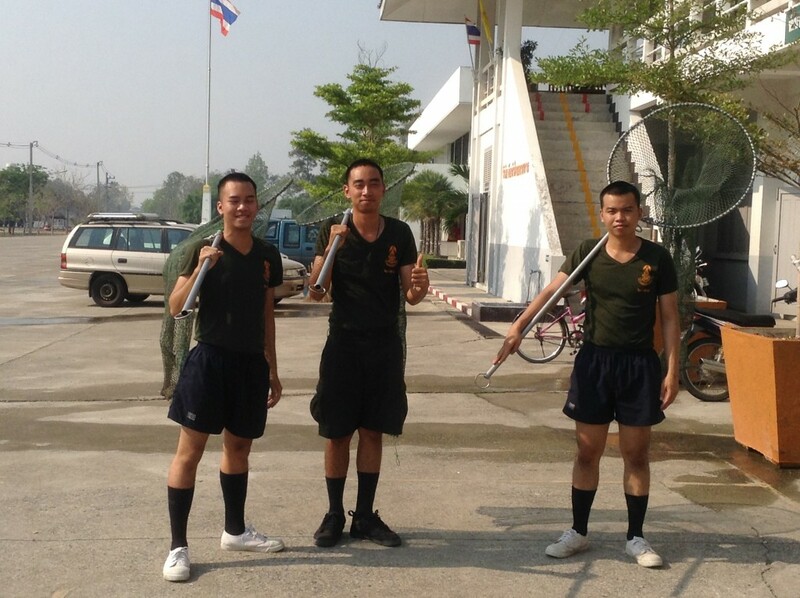 สงสัยป้าญาติคนไข้ คนนั้นแหละ ! 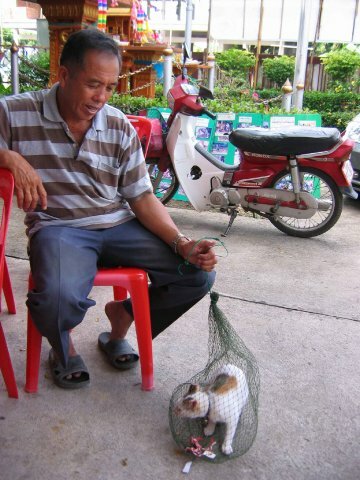 เพราะเห็นจ้องดูแมวอยู่ตลอดเวลา พวกเราก็พาซื่อบอกว่าพึ่งพาไปทำหมันเสร็จเมื่อวาน ตอนที่กลุ่มล้านนาด็อกเรสคิวยกทีมมาทำหมันหมาแมวจรจัดในคณะแพทย์ มช.